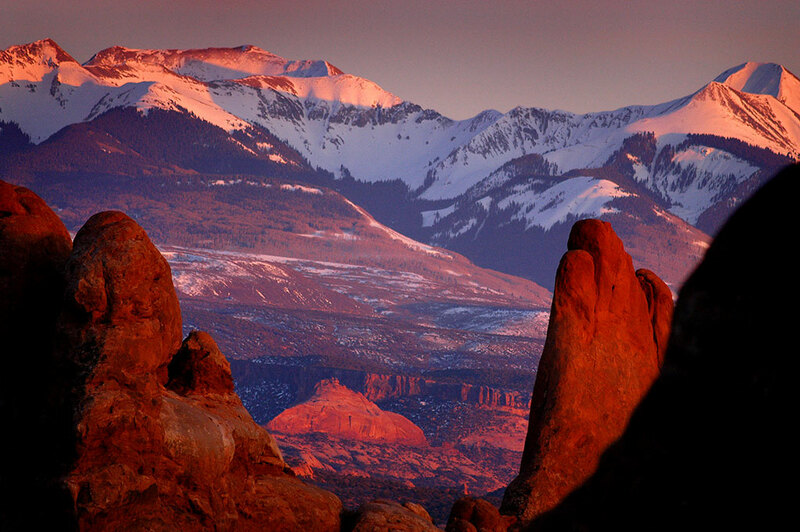 The La Sal Mountains are visible its this view from The Windows section at Arches National Park. 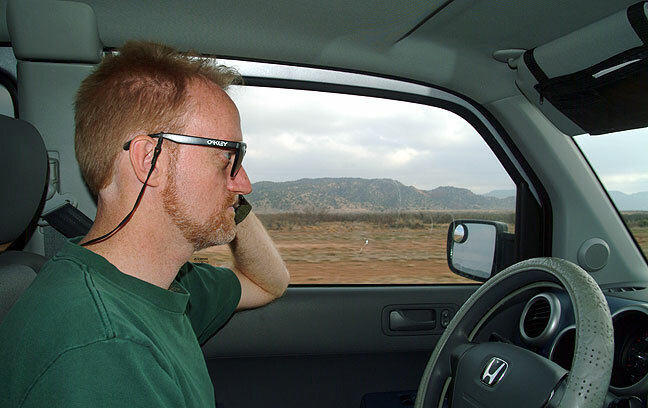 The author drives Michael’s Element near the Texas-New Mexico border. Up early, I drove to Norman, Oklahoma, to pick up my guest for this trip, my long-time friend Michael Zeiler. We made two or three good images, and, except for worthless restaurant service, had a pretty decent travel day. Michael’s Honda Element was well-suited to piling-style packing, and seemed like a good road vehicle. We shared the driving. 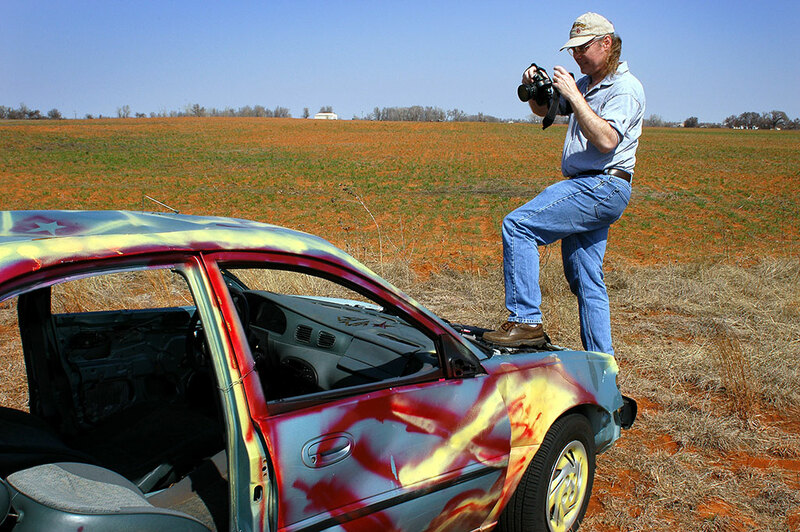 Michael photographs an abandoned car along I-40. As usual, we drove from gloomy weather in Oklahoma to sunshine and a great sunset in New Mexico. 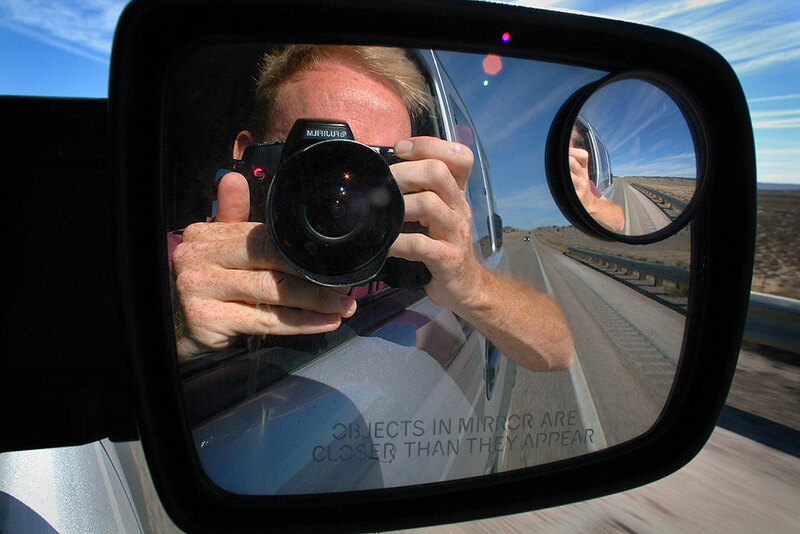 For a while east of and through Albuquerque, Michael had his camera in his hands for an hour, sometimes even shooting out the window through the glass. 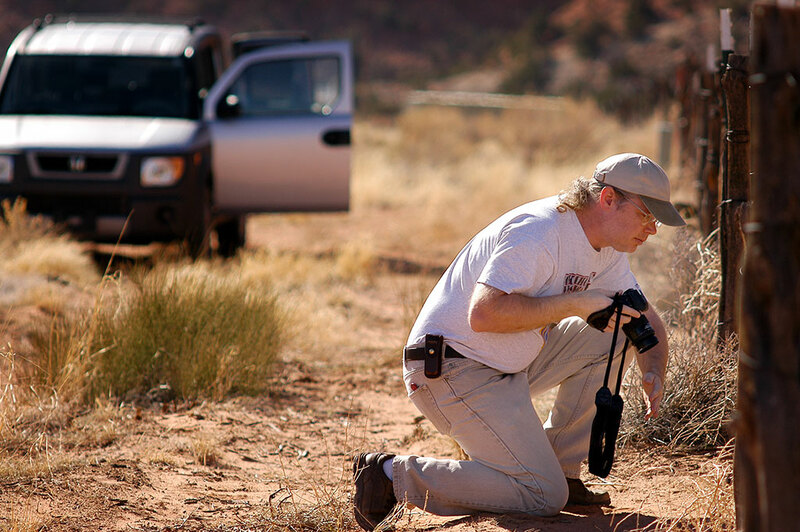 Michael brushes aside some grass as we stop in the Spanish Valley near Moab, Utah to make pictures. 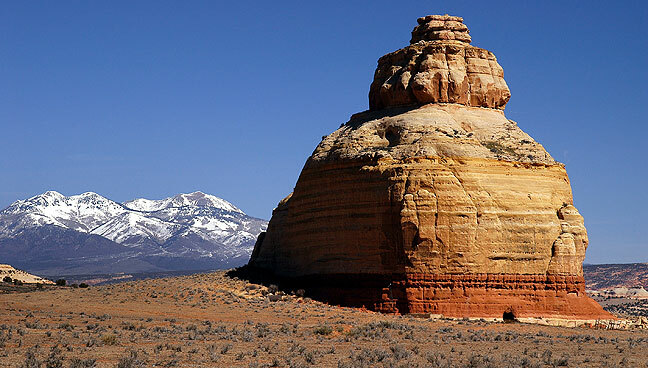 The drive from Farmington to Moab has produced nice images, including the Hogback, the Abajo Mountains, Church Rock, and Wilson Arch. Michael got his Honda Element stuck in some hidden mud east of Monticello while we were photographing the Abajos. I got out and pushed, but we had more luck when he got out and pushed and I drove. 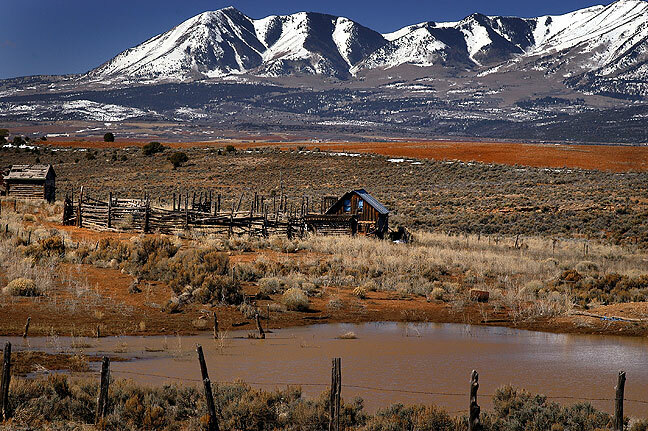 A ranch and Abajo Mountains are visible from near the Utah-Colorado border. It was while we pulled over to make this picture that Michael got his Honda Element stuck in the mud. 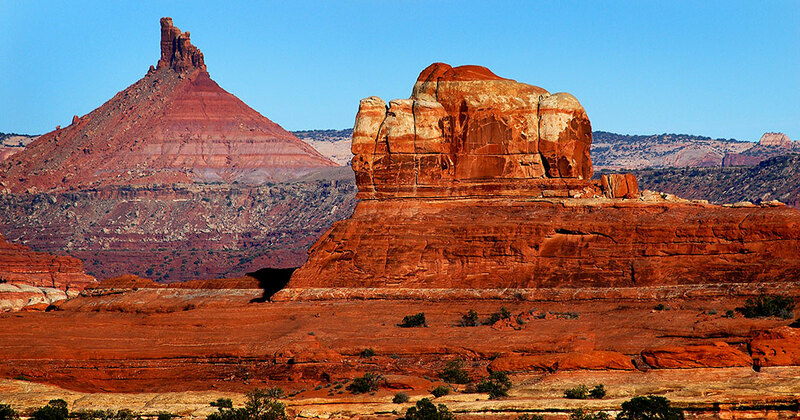 Church Rock stands on the road to Moab, Utah. 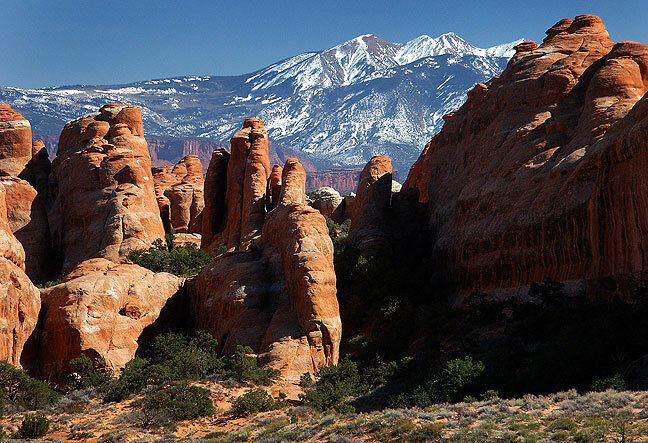 The La Sal Moutains are in the distance. 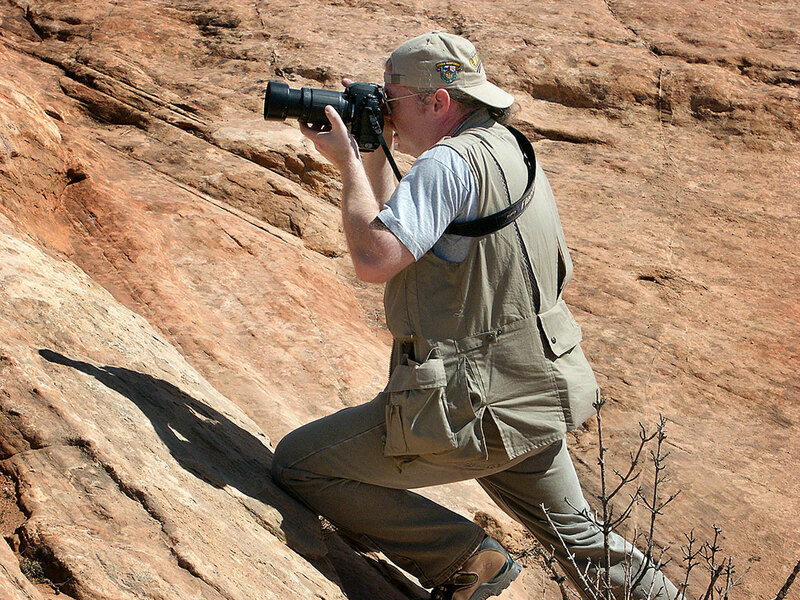 Michael attempts to photograph Church Rock on U.S. 191 in southeastern Utah. 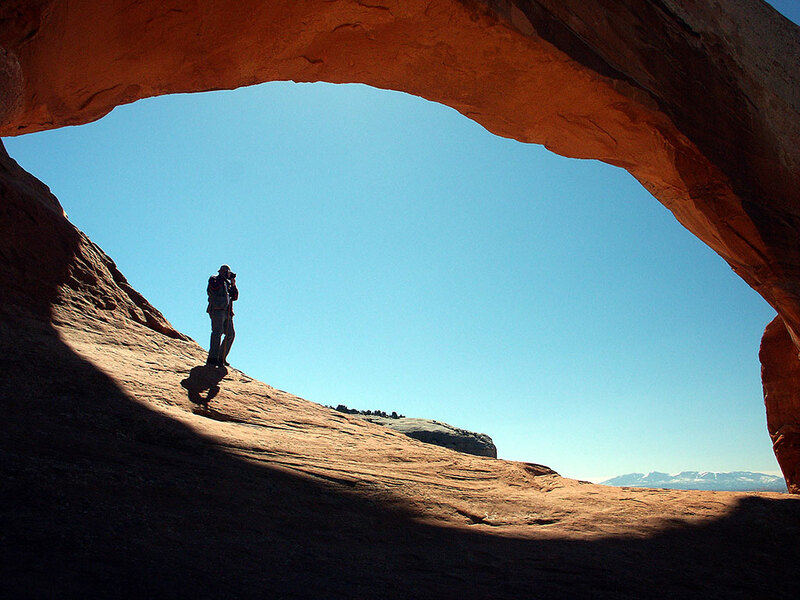 Michael makes images from inside Wilson Arch on the highway south of Moab, Utah. 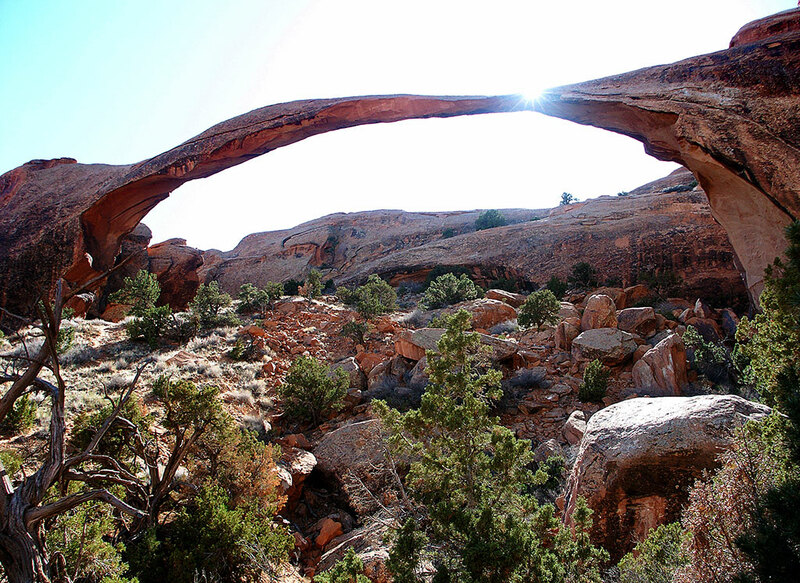 Your host photographs Wilson Arch on our drive to Moab, Utah. 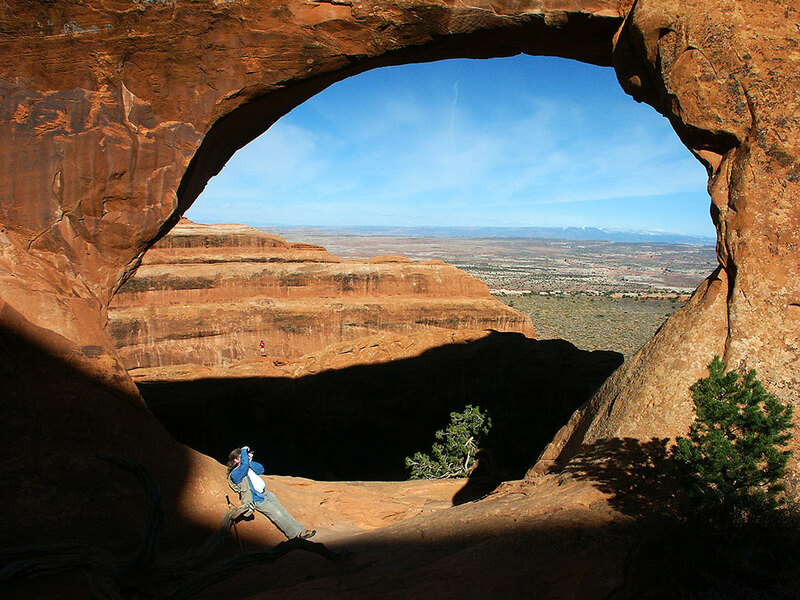 Michael is dwarfed by his surroundings as he makes pictures in the opening of Wilson Arch on U.S. 191 south of Moab, Utah. 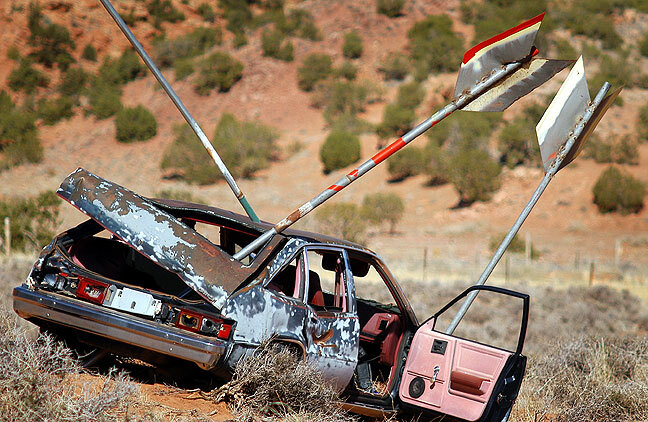 When Michael caught sight of this car shot with giant arrows in the Spanish Valley south of Moab, Utah, he swing his car around so we could shoot it. 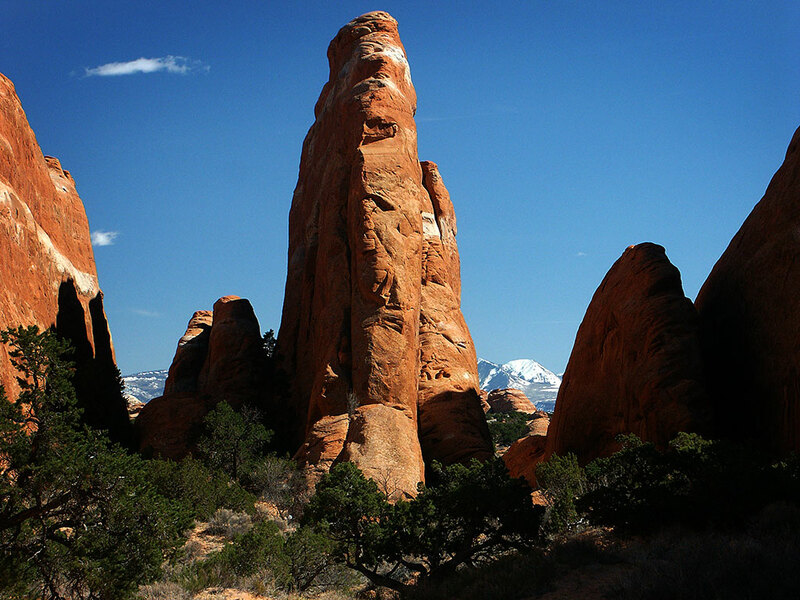 The author poses with a tiny arch on the Devil’s Garden trail at Arches National Park. 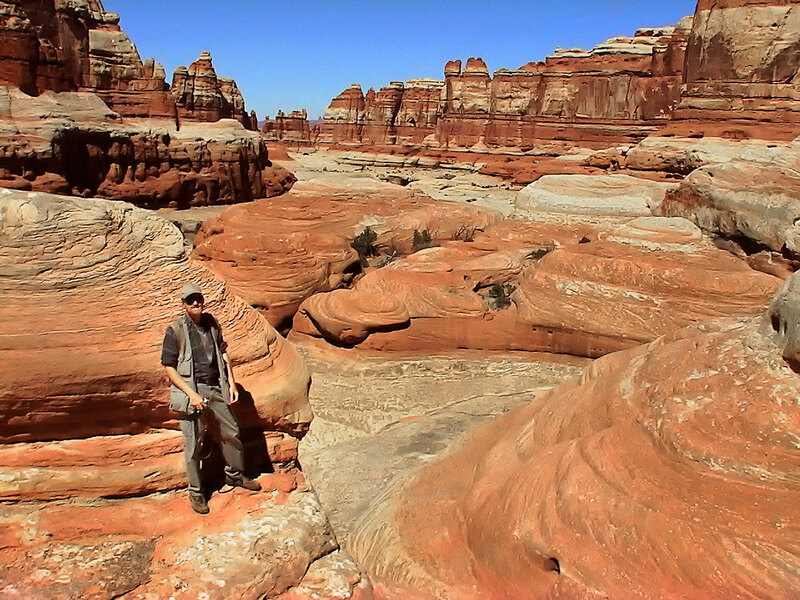 After lunch in Moab, Utah, we hit the trail in Arches National Park, hiking the Devils Garden trail to Double-O Arch. Along the trail were some arches that I had no idea would be so cool, including Navajo Arch, Partition Arch, and Landscape Arch. 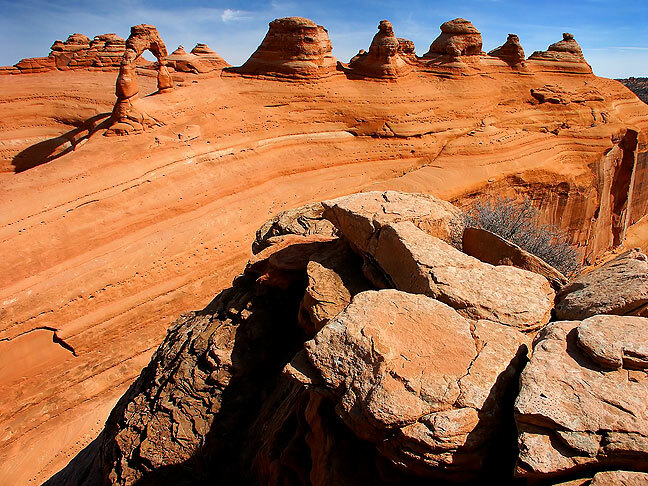 One of our first hikes was the popular Devil’s Garden trail. 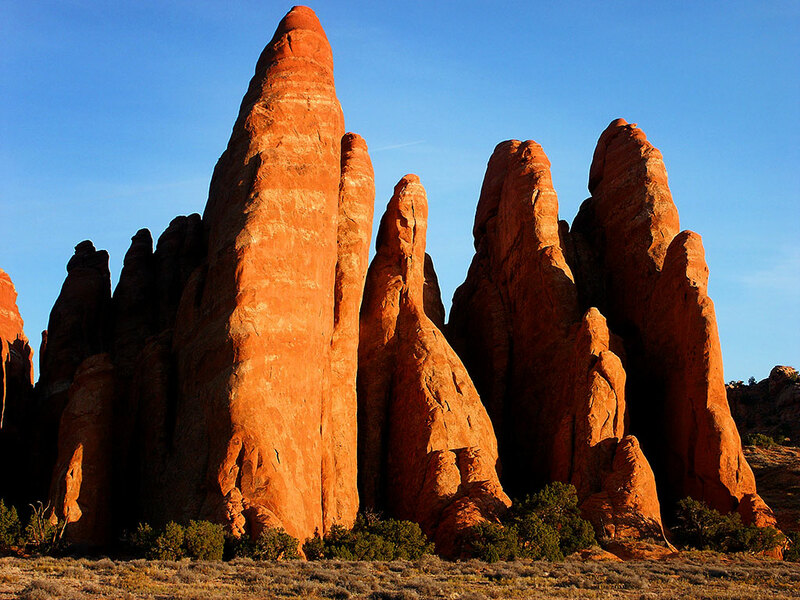 The spires of the Devil’s Garden at Arches National Park stand watch against a clear blue sky. 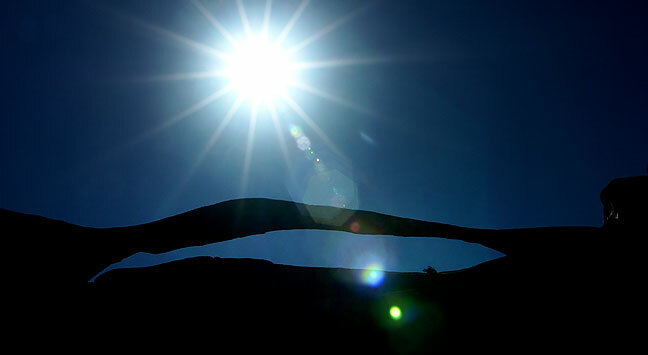 Afternoon sun shines from behind Landscape Arch in the Devil’s Garden in this silhouette. 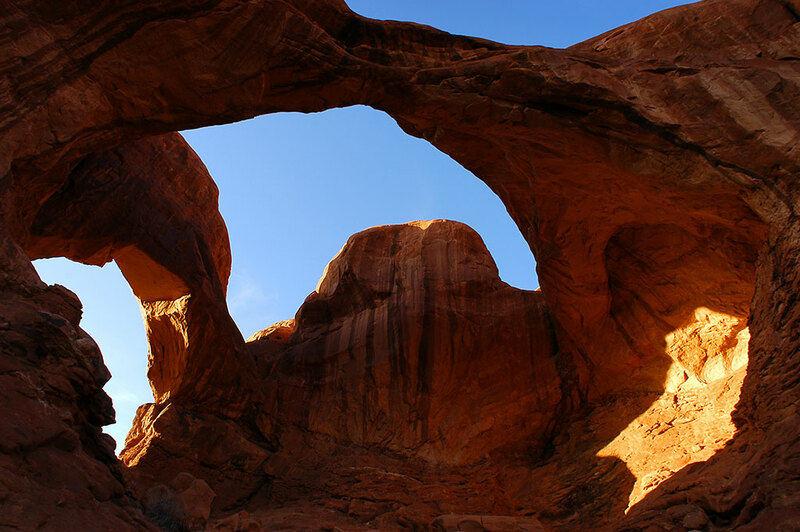 This view of Landscape Arch looks quite different from the previous image, though the two were shot from the same location. 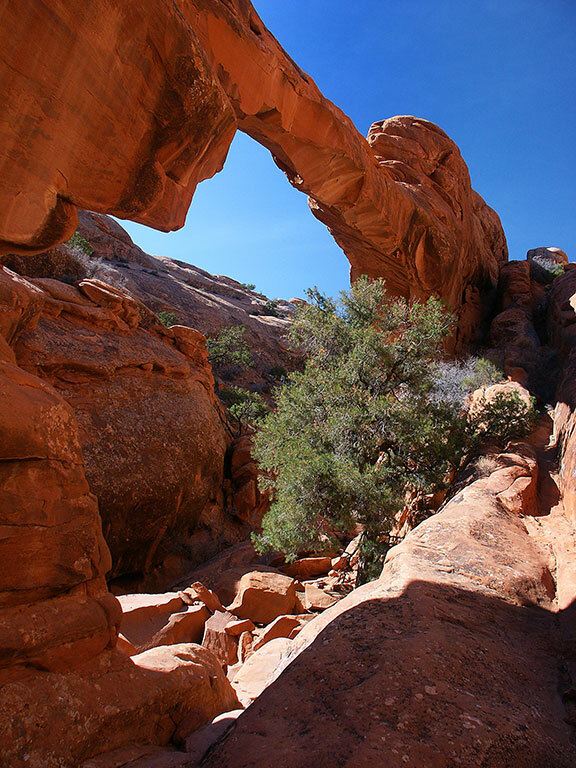 The Devil’s Garden trail passed through Wall Arch. 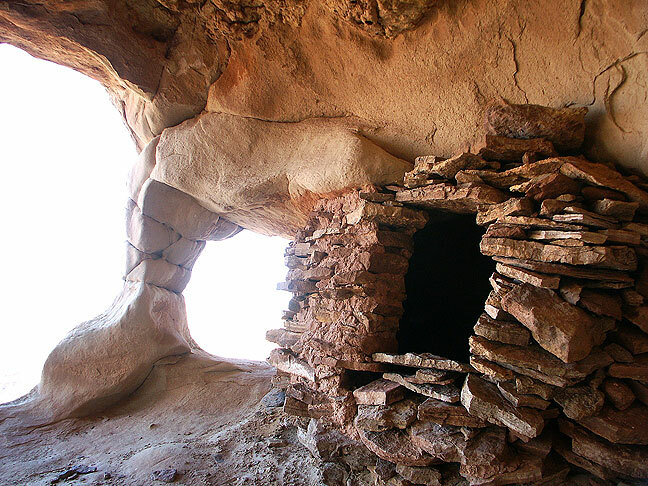 This arch collapsed four years after this image was made. This fisheye view was shot while standing in the center of the larger of the two openings at Partition Arch. Michael uses my 14mm lens to photograph Partition Arch. This is Partition Arch shot from the other side. 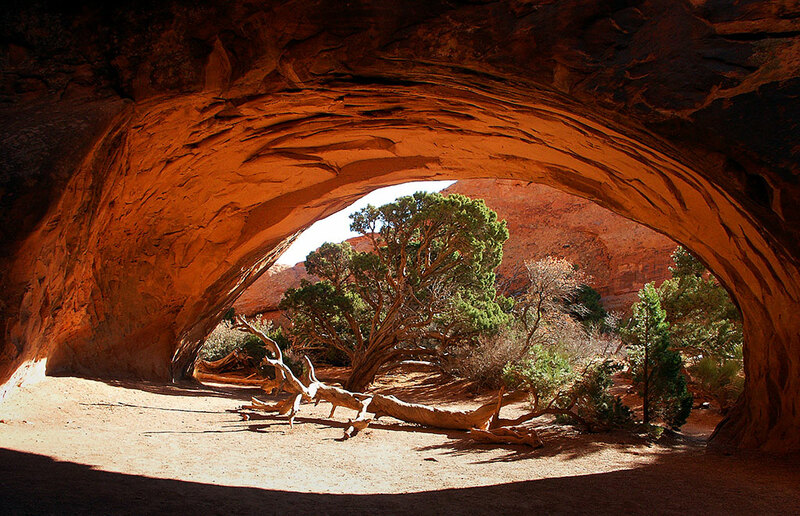 Farther along the Devil’s Garden trail is Navajo Arch. We found this young woman doing an arch pose in the opening of Navajo Arch in Arches National Park. 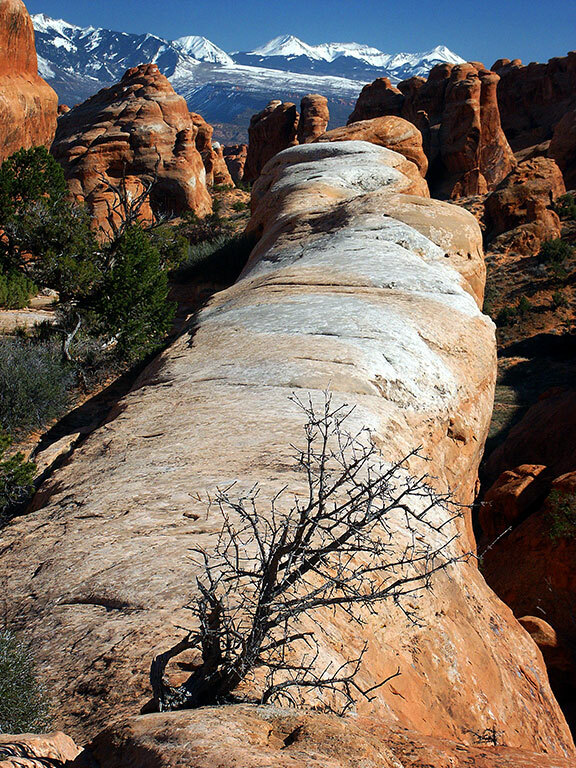 A portion of the Devil’s Garden trail follows this fin. 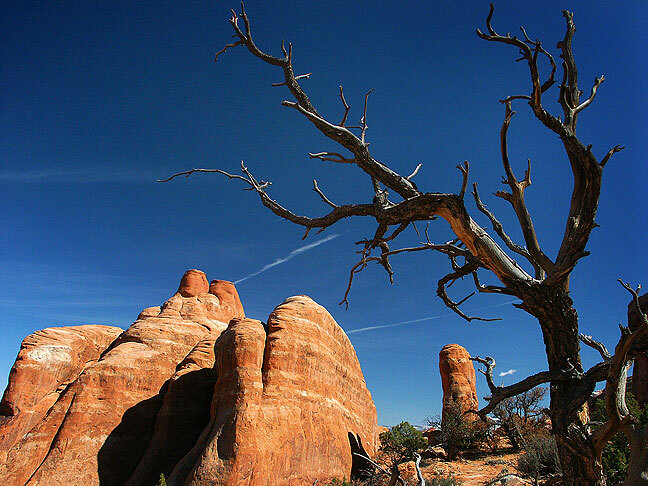 This view from deep in the Devils Garden trail looks northeast. 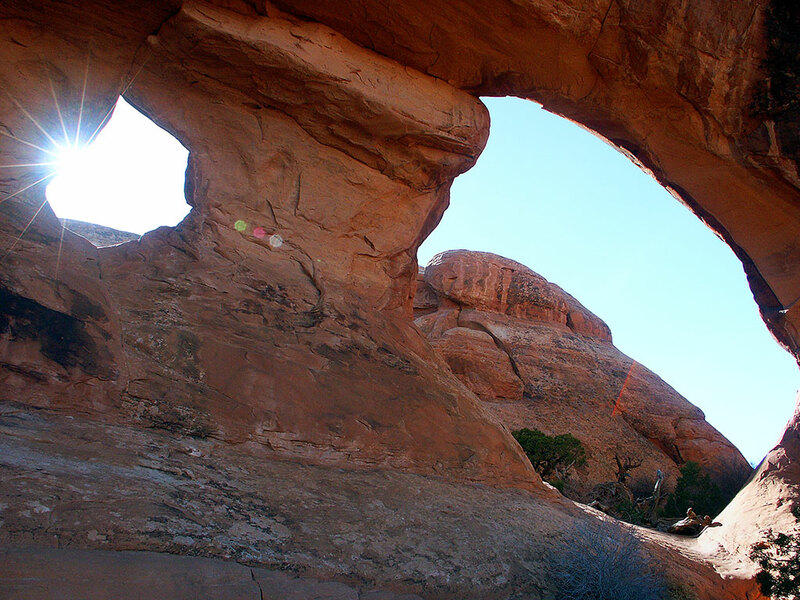 Double-O Arch is at the end of the Primitive Loop trail on the north end of Arches. 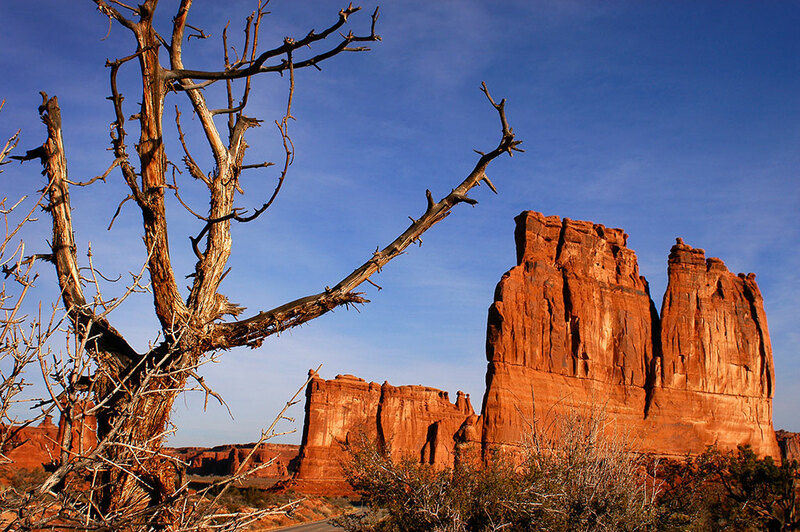 The Courthouse Towers, on the main road at Arches, stand in handsome morning light. We shot the Courthouse Towers on the way in to Arches at first light, then found our way to the Windows section for the classic shot through the North Window of Turret Arch. This is a well-known view for shooting The Windows at sunrise: looking through the North Window at Turret Arch. We didn’t get to this spot as early as I would have liked, but the morning light was still quite nice. 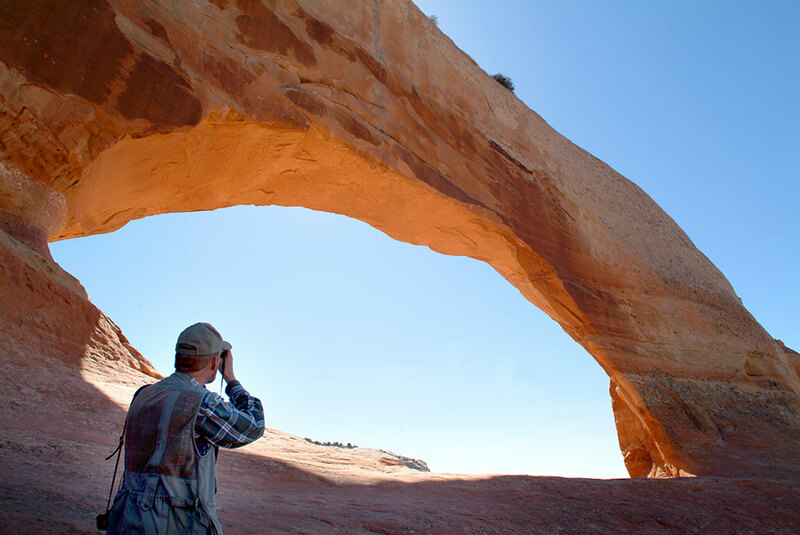 Your host photographs Frame Arch just around the corner from Delicate Arch in Arches National Park. 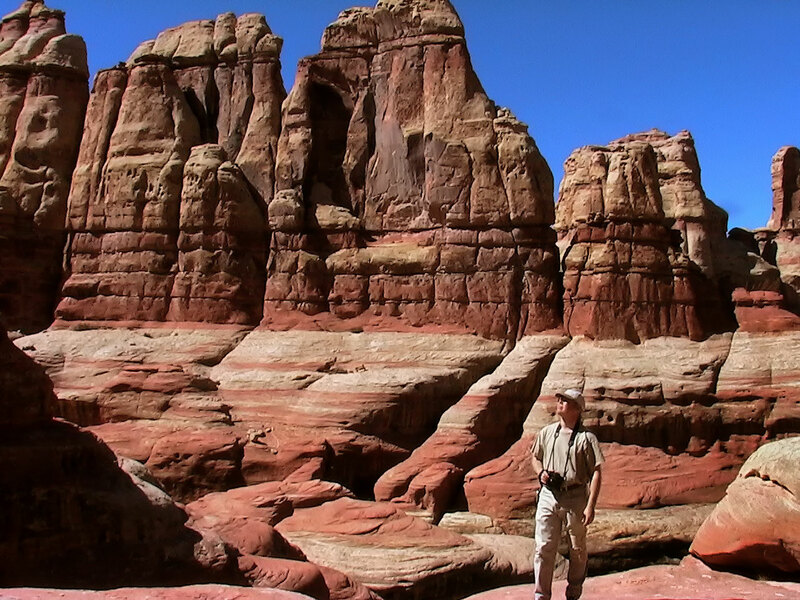 At mid-morning, we hiked to Delicate Arch and explored the area more than I had in 2002. We also drove to the Delicate Arch viewpoint, which was more interesting that I expected. 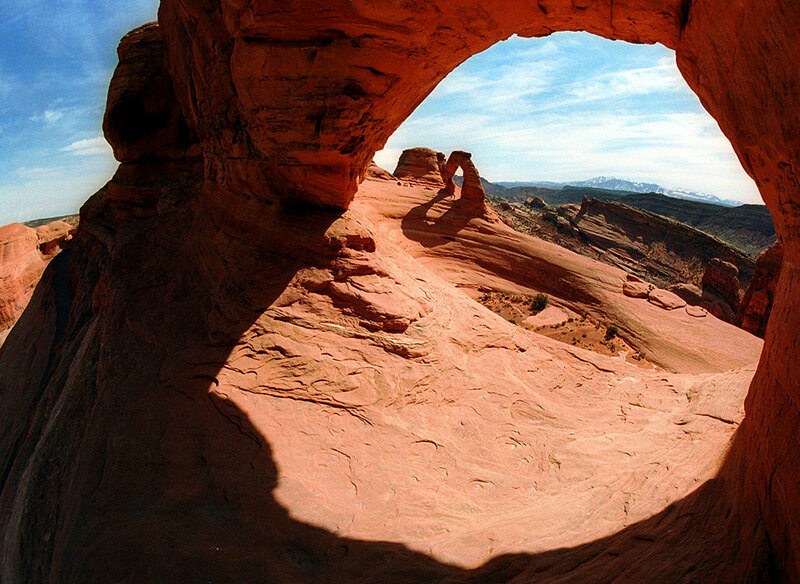 This view looks through Frame Arch at Delicate Arch. 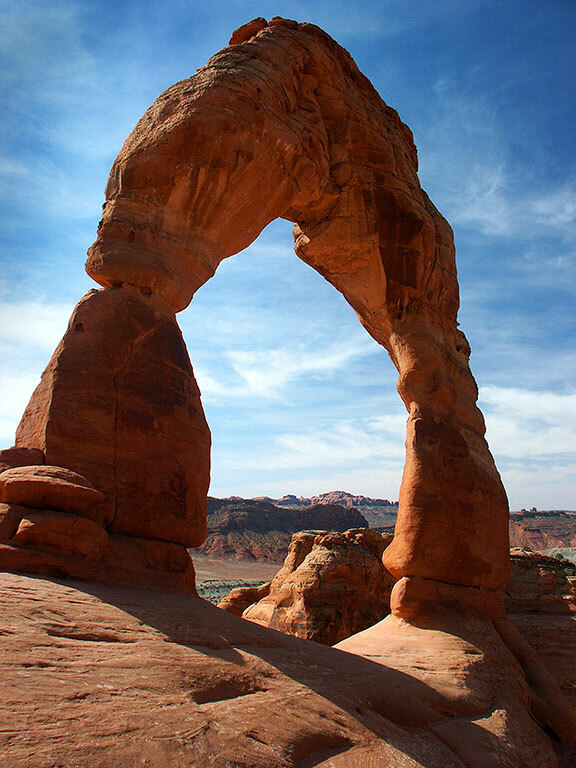 This view of Delicate Arch is from across a canyon to the south. 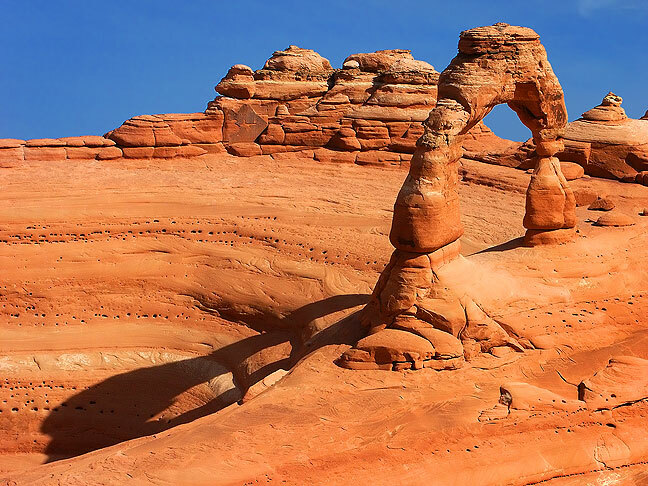 Mid-morning light shines on Delicate Arch in Arches National Park. 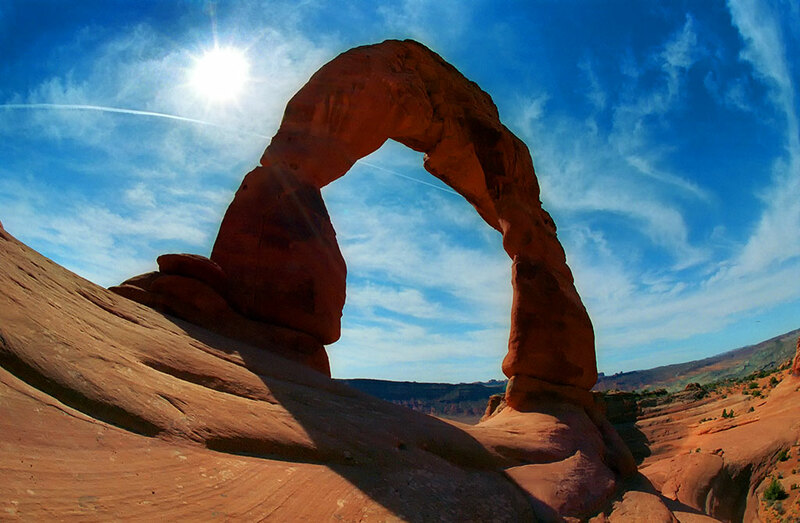 This is a fisheye view of Delicate Arch. 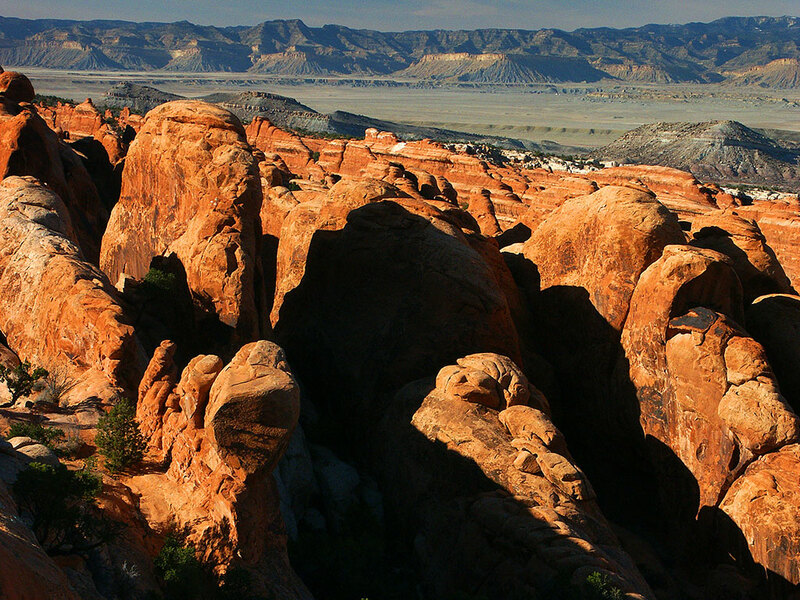 This view looks down on Delicate Arch from a ridge above and to its east. The ridge on the other side of the canyon in visible, as is the road to the trail head on the far right. 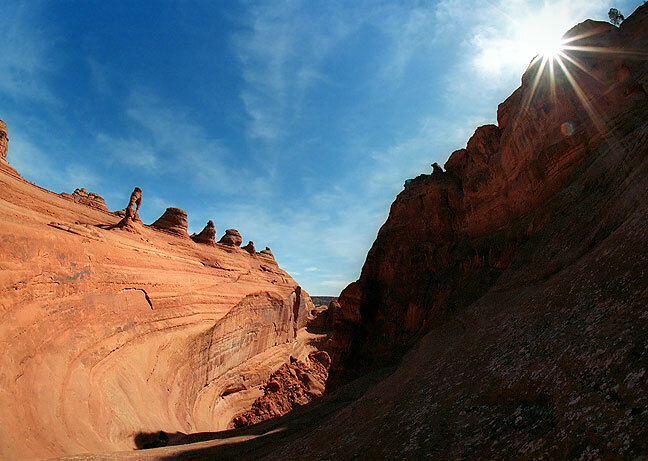 This is a fisheye view from across the canyon from Delicate Arch. 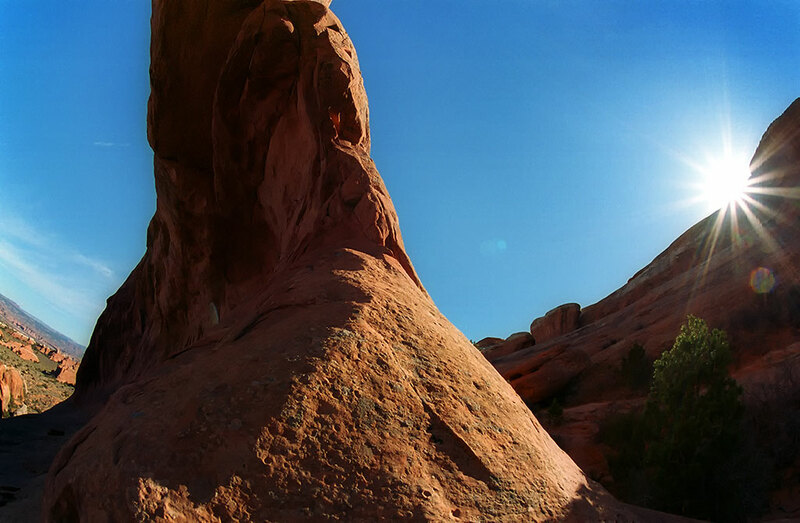 This is a wider view of Delicate Arch from the across the canyon. 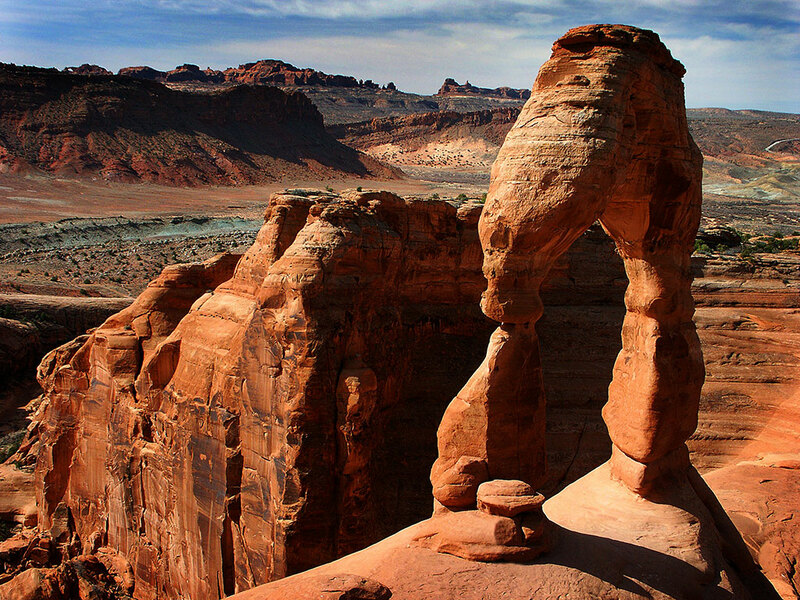 The Delicate Arch Viewpoint is separated from Delicate Arch by a beautiful, imposing group of canyons and washes. 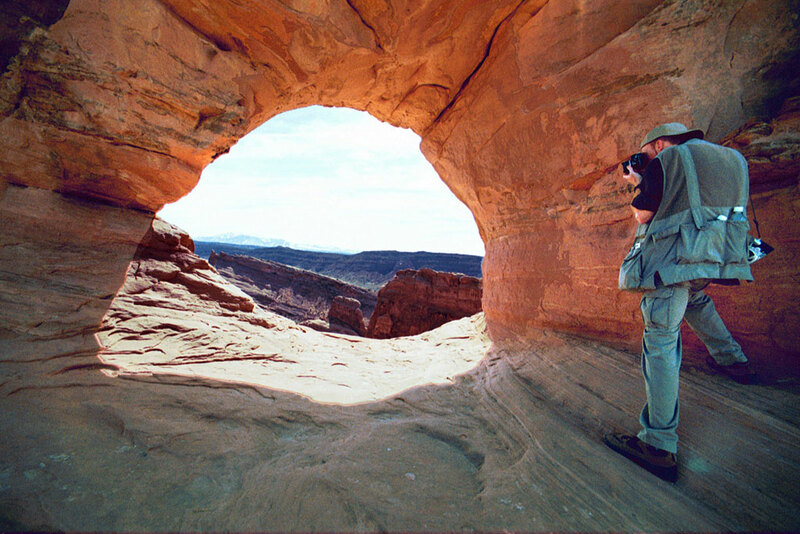 Michael makes images at the Delicate Arch Viewpoint at Arches National Park. 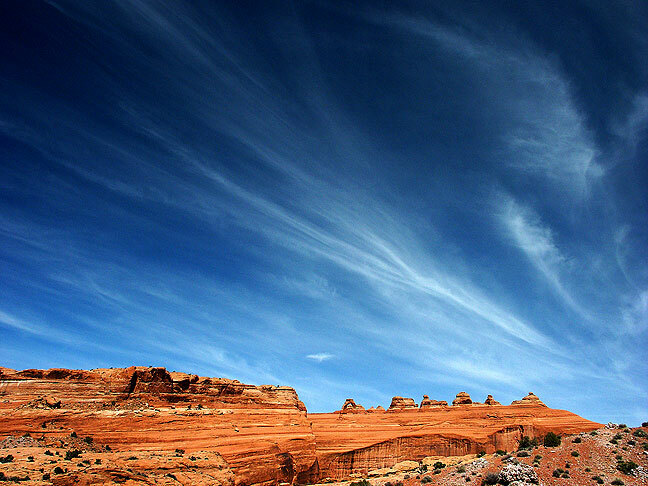 A deep blue sky filled with beautiful cirrus formations greeted us at the Delicate Arch viewpoint. 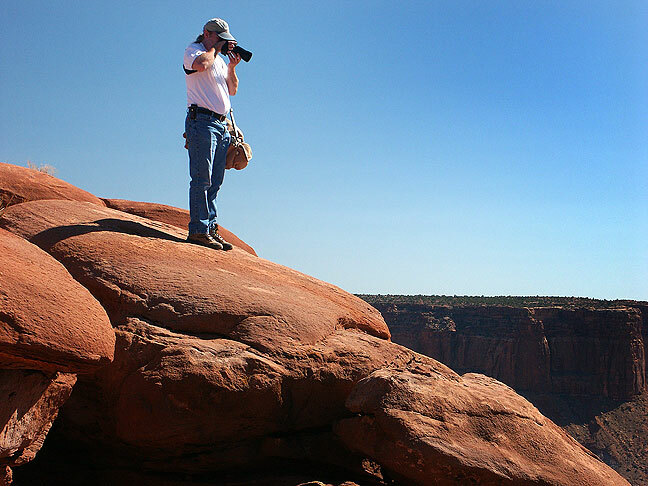 Michael made this image of me at the Delicate Arch viewpoint. After lunch and a few miscellaneous items, we took the ranger-guided tour of the Fiery Furnace. 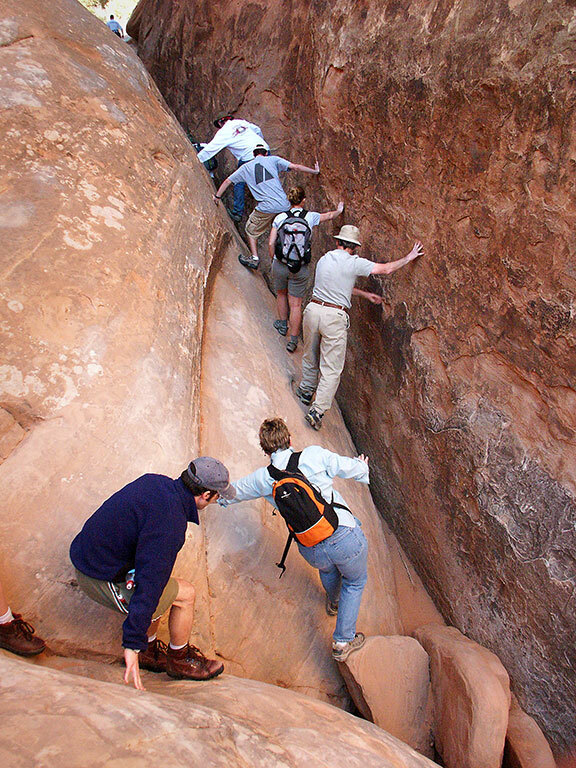 Members of our Fiery Furnace tour group funnel into a fissure as we make our way to Surprise Arch. 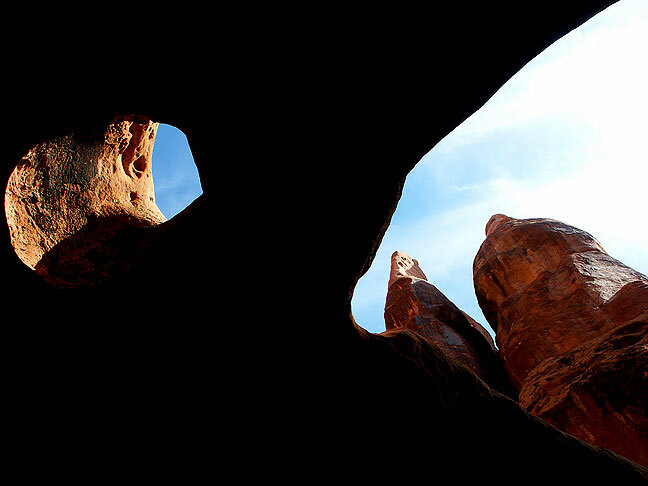 This view looks up through a pour-off arch in the heart of the Fiery Furnace. 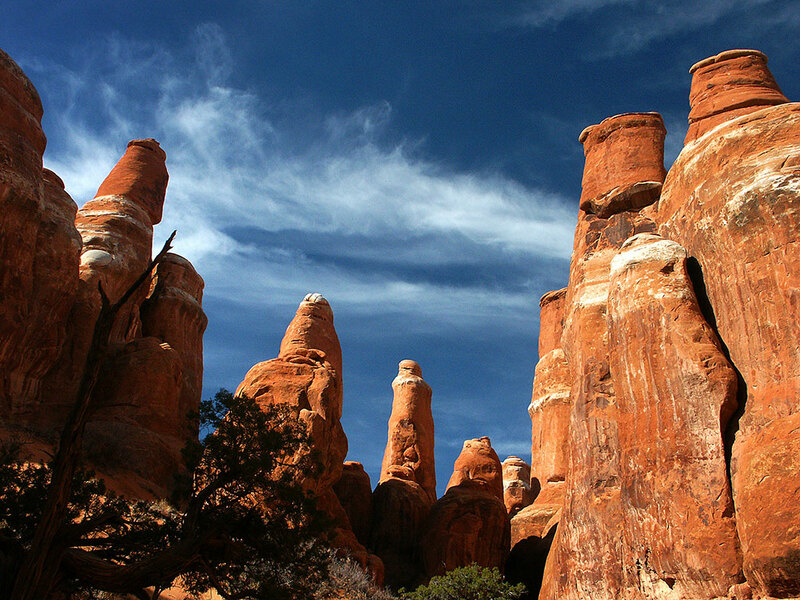 Fins and spires stand in the Fiery Furnace at Arches National Park. 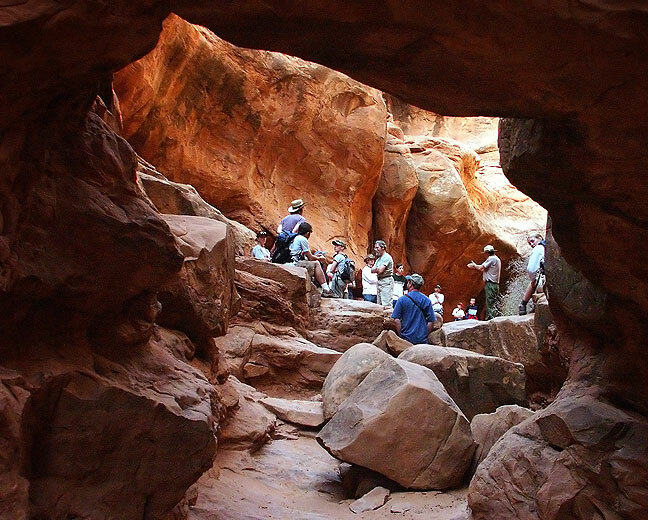 A Fiery Furnace tour group is visible through Walk-Through Arch. 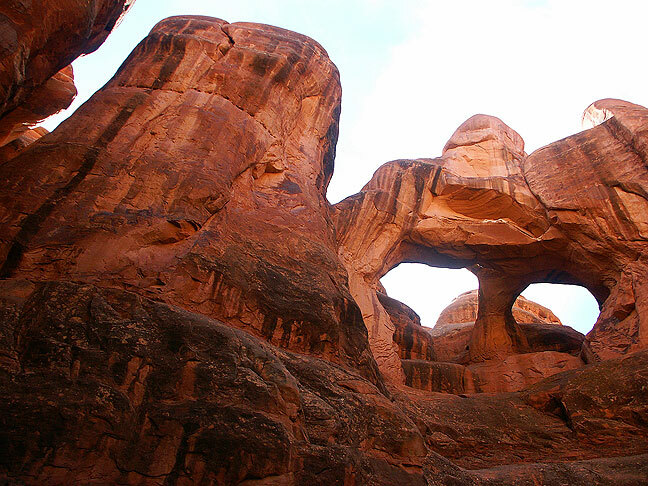 Skull Arch in the Fiery Furnace also sometimes goes by the nickname Underpants Arch. 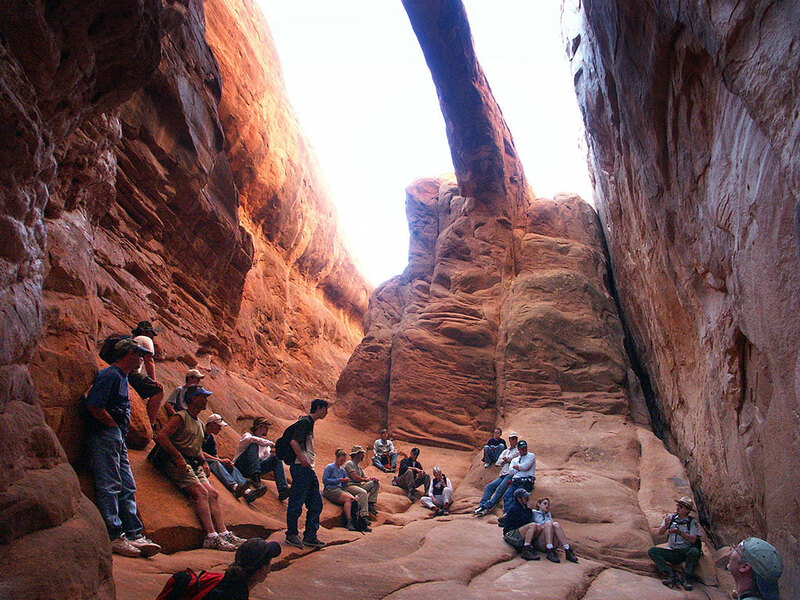 Our Fiery Furnace tour group stops to marvel at Surprise Arch. 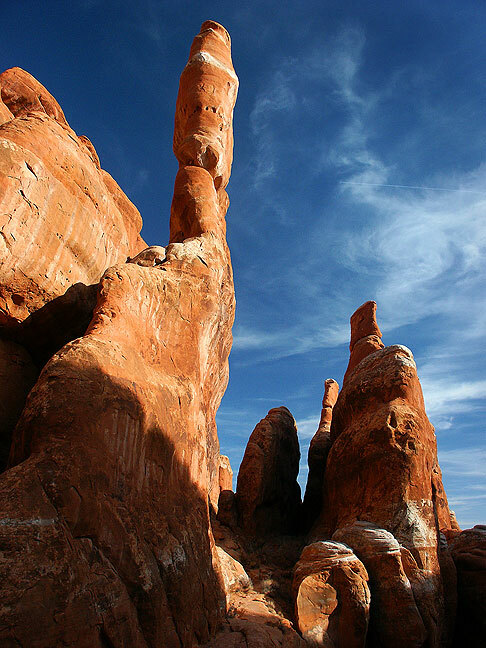 Entrada sandstone spires at The Fiery Furnace at Arches National Park are set against a perfect blue sky. 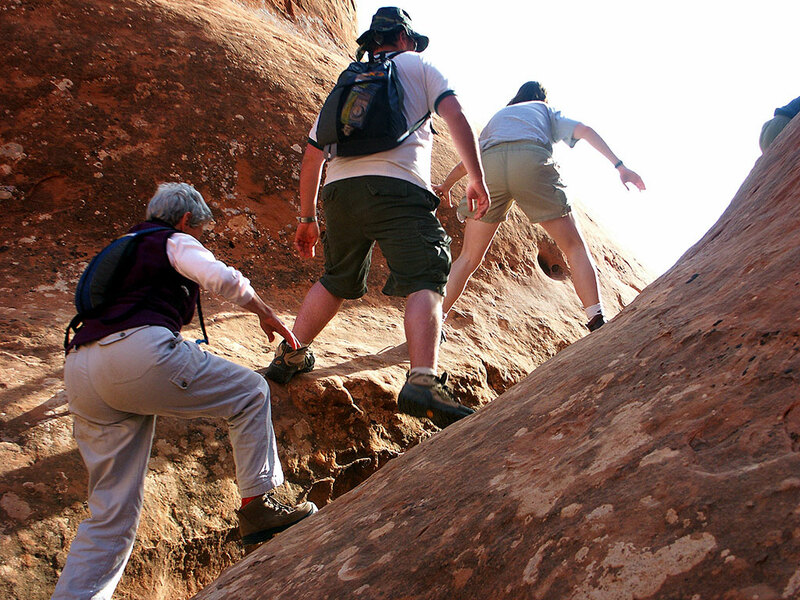 Our Fiery Furnace tour group makes its way up a fissure. 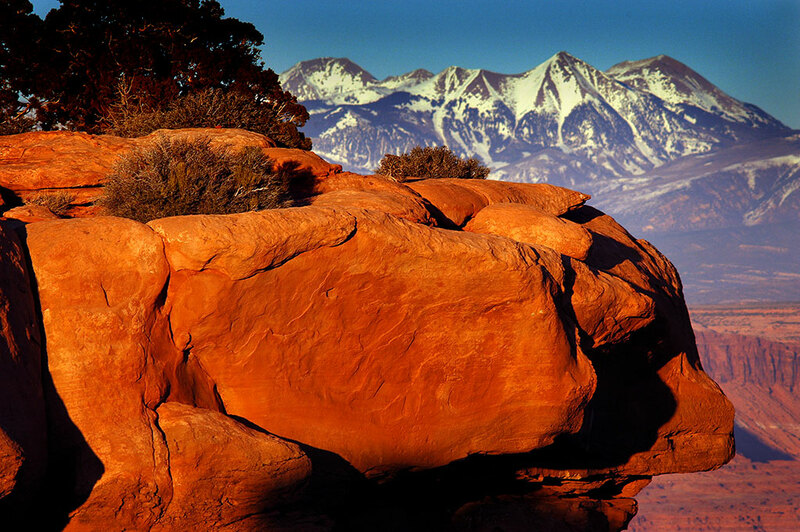 This image of the Fiery Furnace includes the La Sal Mountains in the distance. 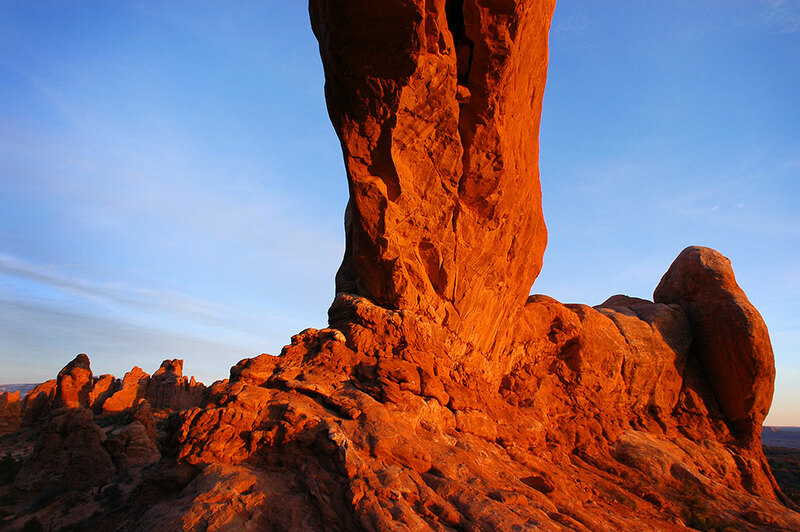 We photographed these fins near Sand Dune Arch in Arches after our Fiery Furnace tour on our way to The Windows for sunset. 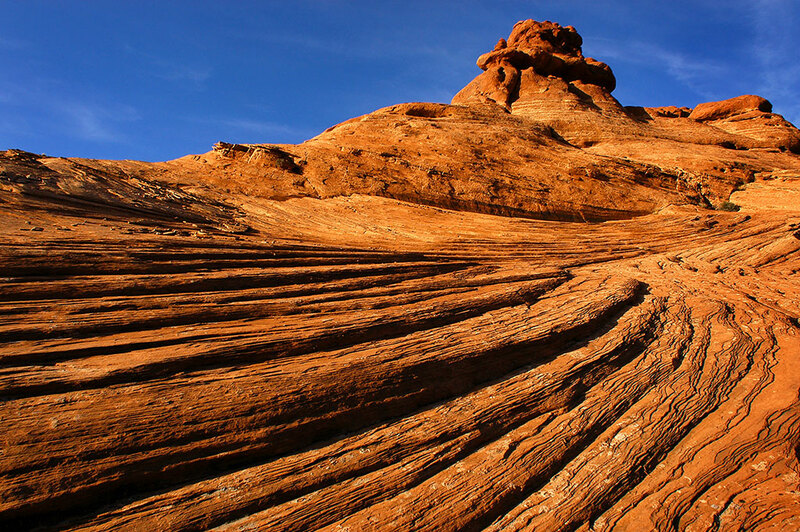 We spotted this swirl of sandstone on the road to The Windows Section at Arches as evening approached. By evening, we shot a nice wave-like formation in the Windows section. I met a nice woman in Double Arch who said it was her favorite place in the world, and we bid each other “Namasté.” We caught last light at the Garden of Eden section. 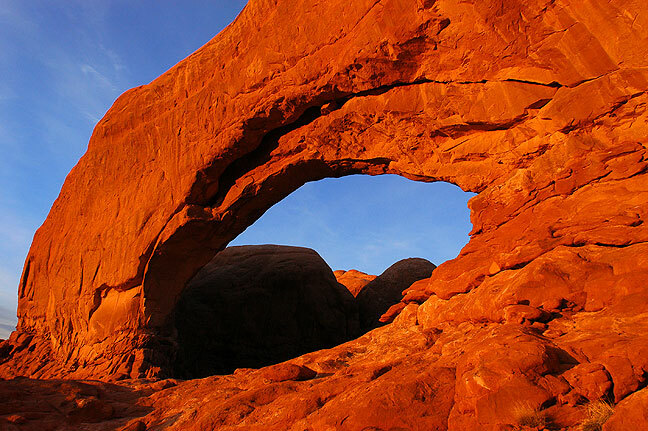 Double Arch in Arches’ Windows section takes on nice light as evening approaches. Movie fans will recall this spot from the beginning of Indiana Jones and the Last Crusade. Sunset lights North Window in the Windows at Arches National Park. 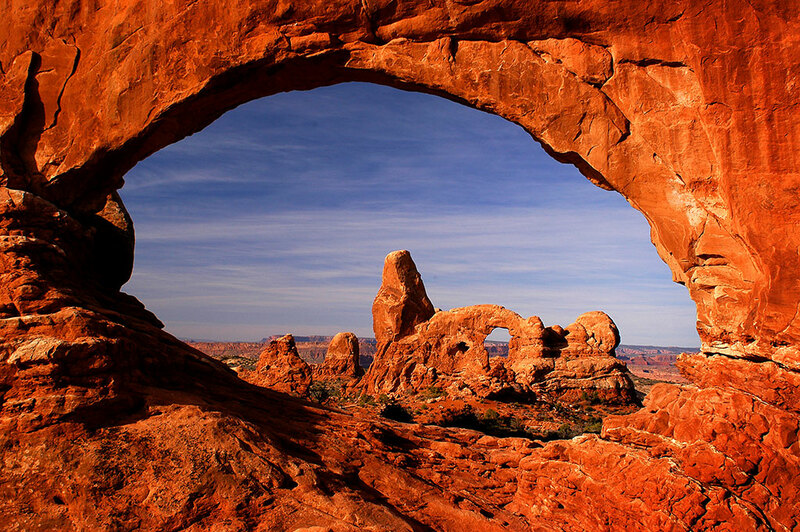 This image was made standing in the opening of the North Window in The Windows section at Arches. 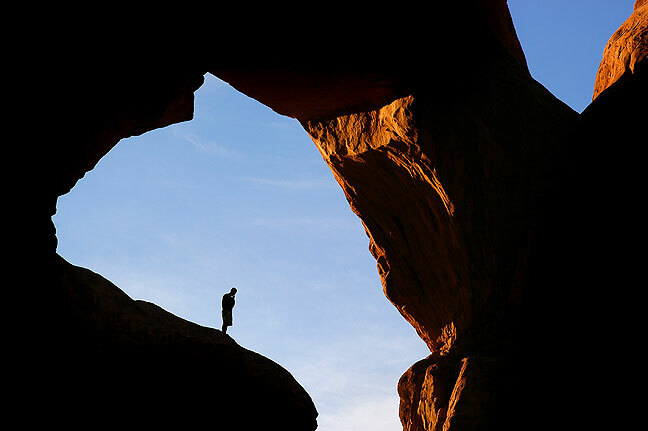 A hiker appears in an opening at Double Arch in The Windows section at Arches National Park. 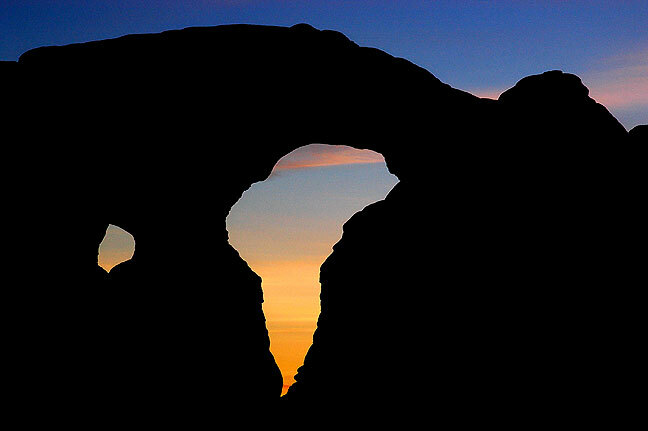 Last light graces the Windows section at Arches National Park. 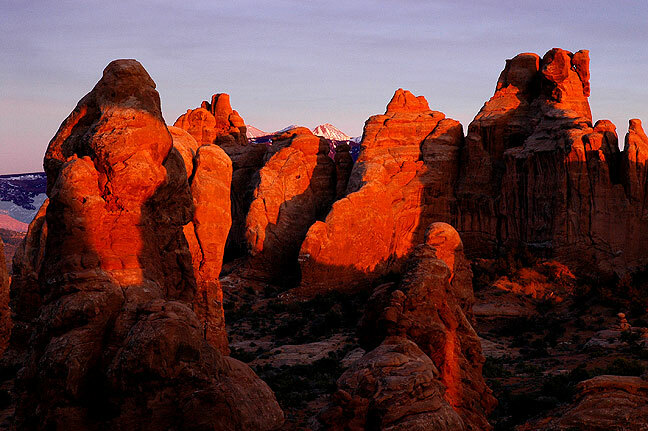 Last light shines on the Garden of Eden at Arches National Park. 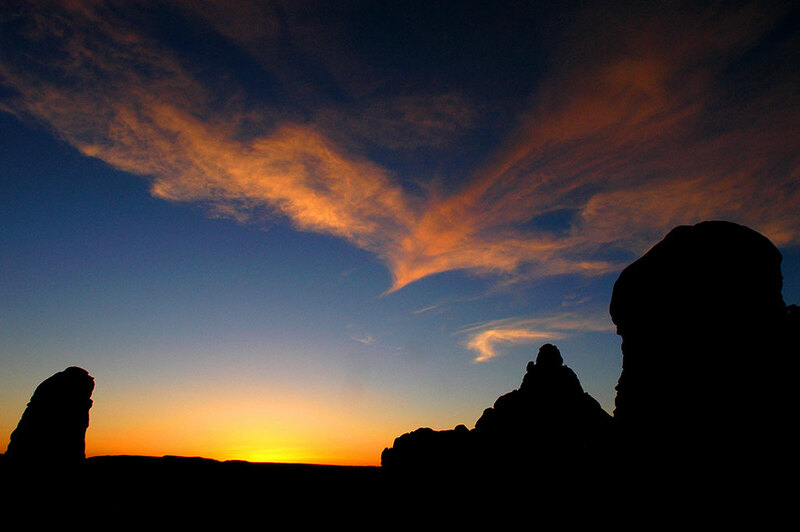 Turret Arch is silhouetted against the sky after sunset at Arches National Park. 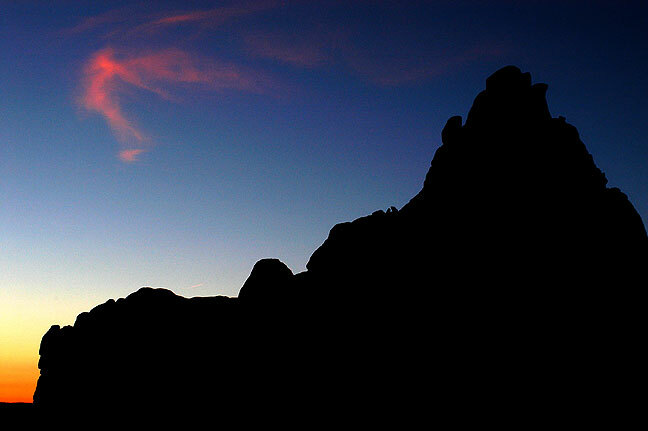 We made this image after sunset at Arches’ Garden of Eden. 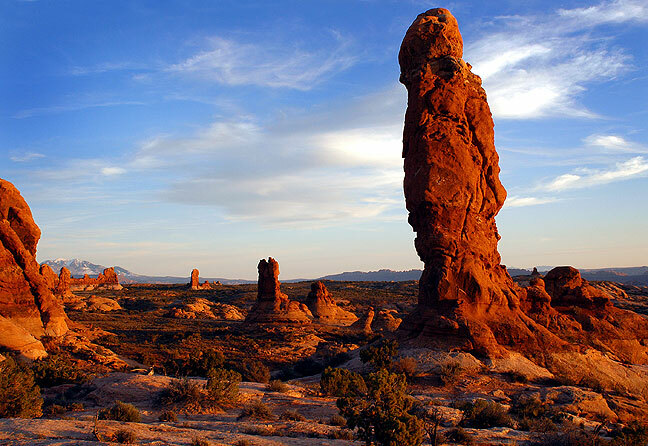 The sky takes on color well after sunset in the Garden of Eden at Arches National Park. 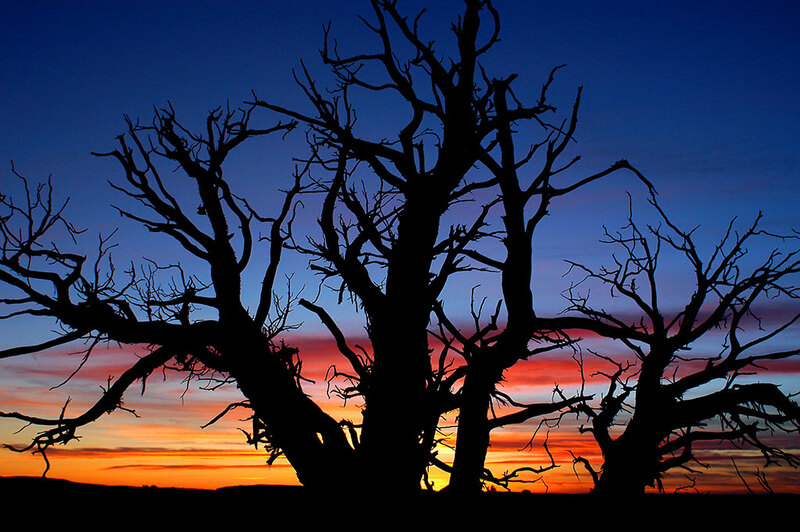 After sunset, I shot this dead tree in The Windows section at Arches National Park. 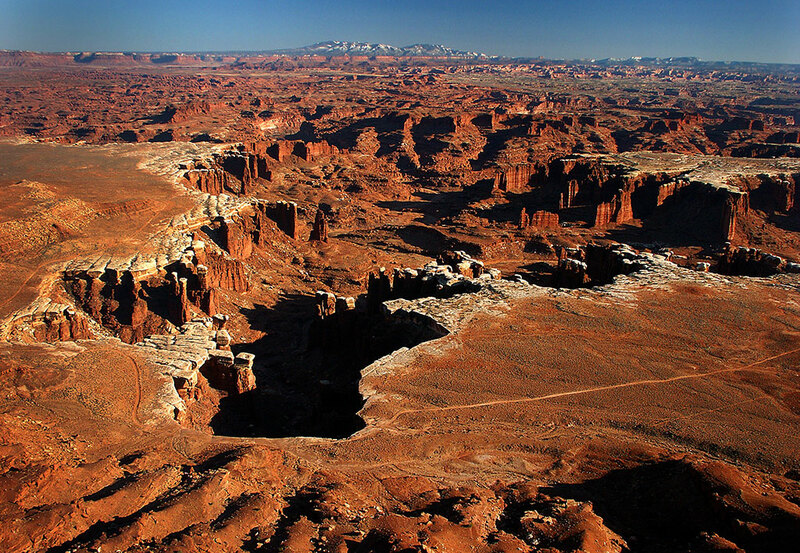 Our first item for the day was the Island in the Sky district of Canyonlands National Park. We stopped at the visitor center to buy gifts for Abby. We made the short hike to Mesa Arch, which didn’t really make pictures, then hiked the Crater View trail at the Syncline Loop, and the short trails at Whale Rock and Aztec Butte. 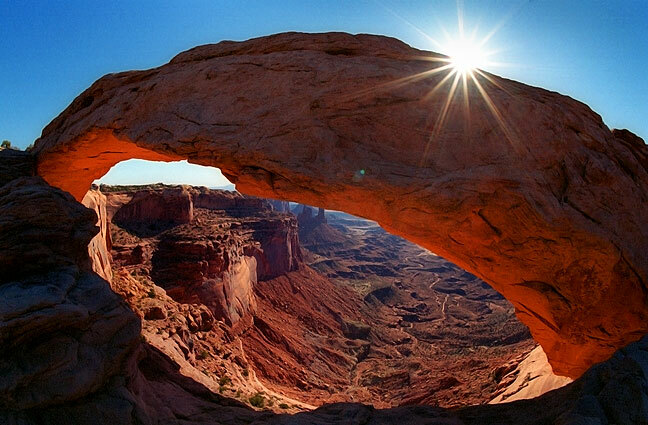 This fisheye view shows Mesa Arch in the Island in the Sky district at Canyonlands National Park. 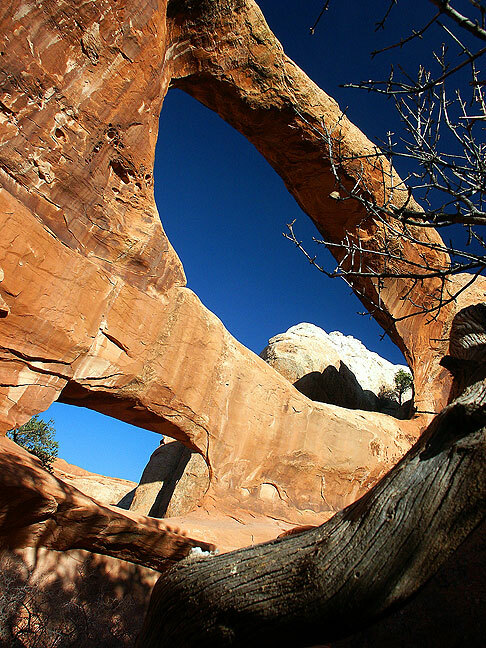 This fisheye view of Canyonlands’ Mesa Arch, made at about 9 a.m., shows Washer Woman Arch and the La Sal Moutains through the opening. 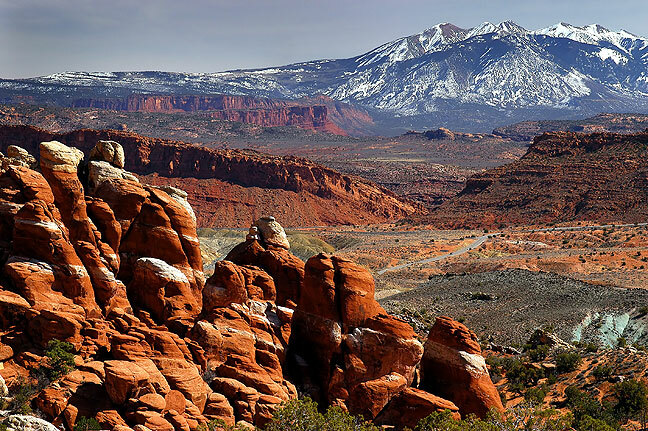 The La Sal Mountains are visible in this image made from the Crater View trail en route to Upheaval Dome at Canyonlands. 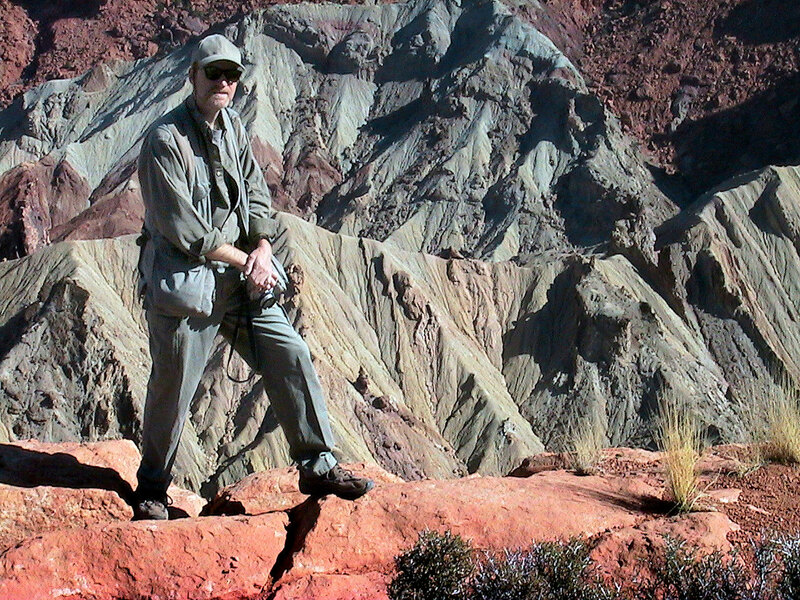 The author poses for a photo at Upheaval Dome at Canyonlands. After lunch, during which I spilled lentils on my 300mm, we drove to the Green River Overlook, but were too early for really nice light, so we hiked the Murphy Point trail to the point. 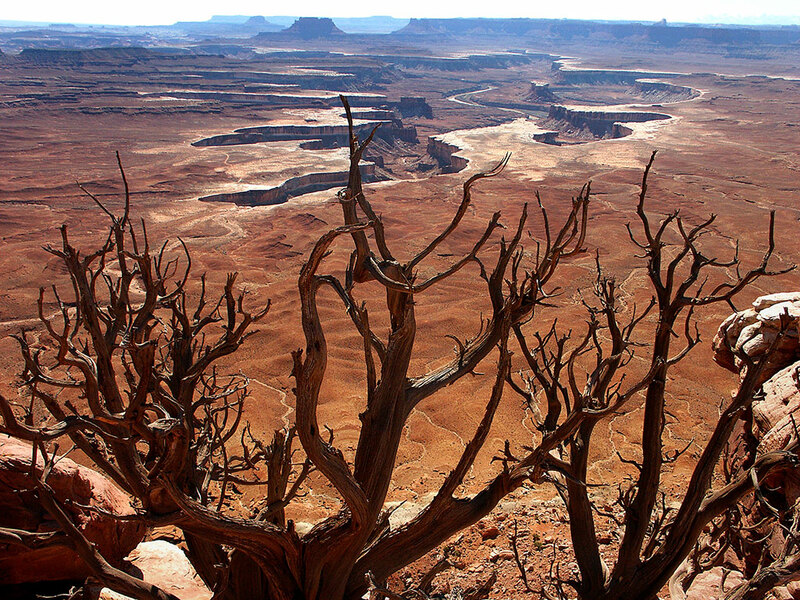 A dead tree stands watch at Green River Overlook at Canyonlands National Park. The Murphy Point Overlook trail is short and easy, and affords handsome views of the Green River and The Maze district across the Green River to the west. 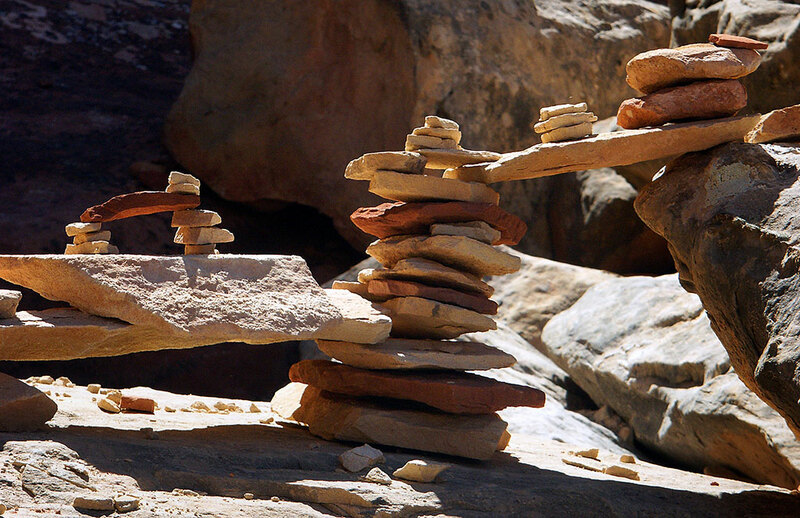 Later in the afternoon, we hiked the White Rim Overlook Trail to the overlook. This commanding overview at the White Rim Overlook at Canyonlands definitely benefitted from some of the clearest air I have ever experienced. 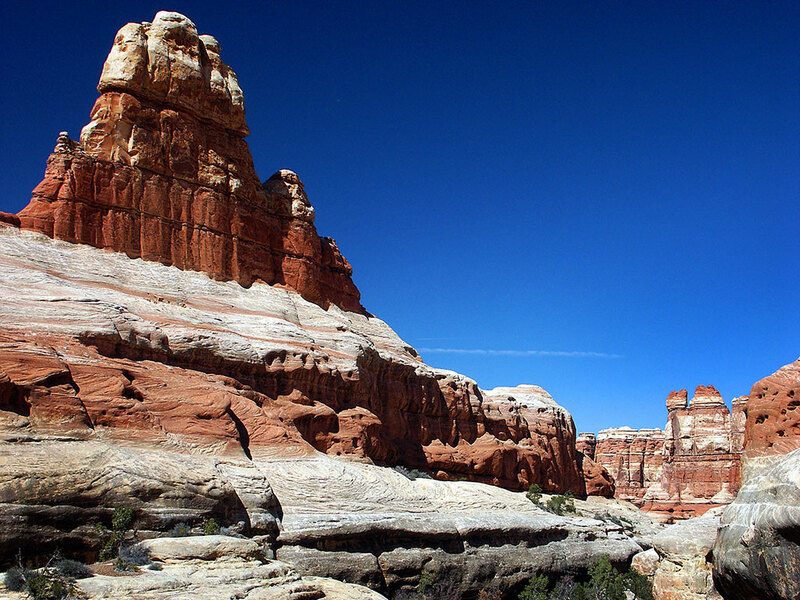 Looking north from the White Rim Overlook trail affords excellent views of the Wingate sandstone cliffs above the White Rim at Canyonlands. 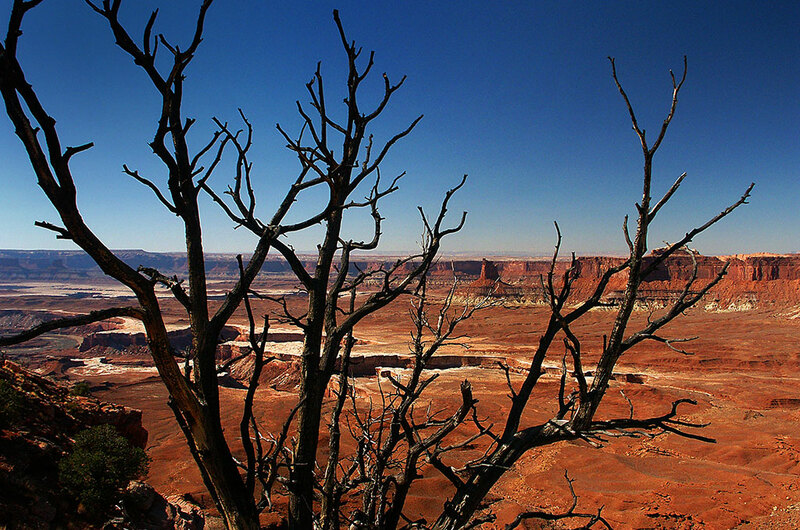 With perfectly clear air, the White Rim comes into shape view from the Overlook trail. 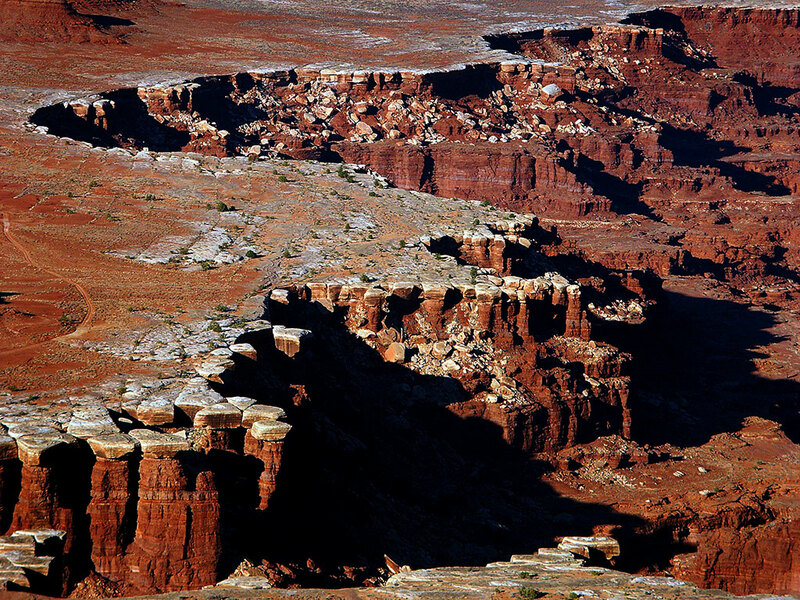 Monument Basic below the White Rim is visible in this view from the White Rim Overlook trail at Canyonlands. Finally, the sunset at Grand View Point was supremely clear. 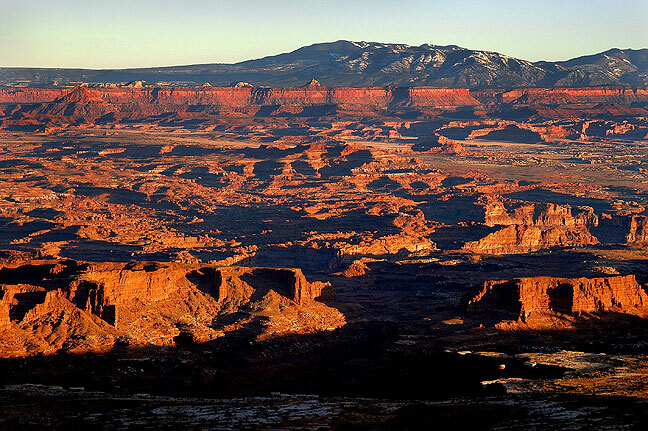 Looking south from Grand View Point at Canyonlands shows the Needles district and the Abajo Mountains. This was the clearest I have ever seen it in this location. 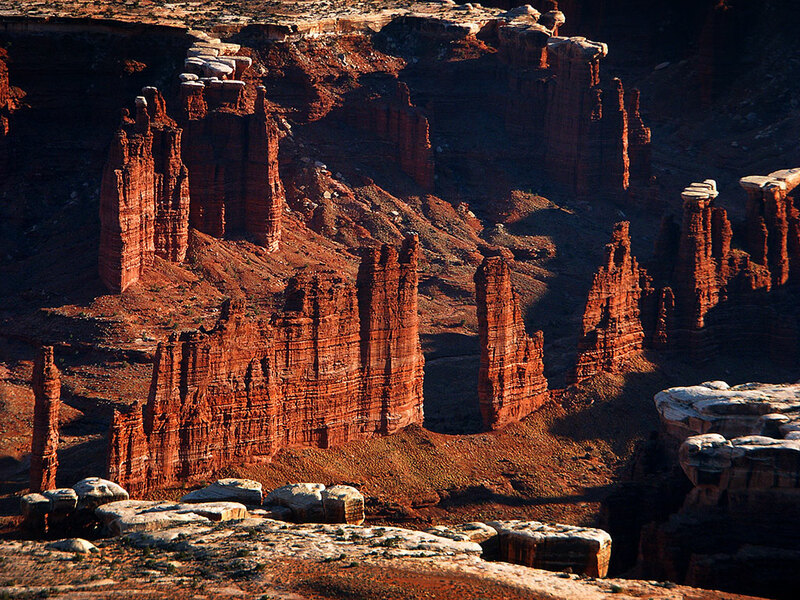 Your humble host photographs Canyonlands from Grand View Point as sunset approaches. 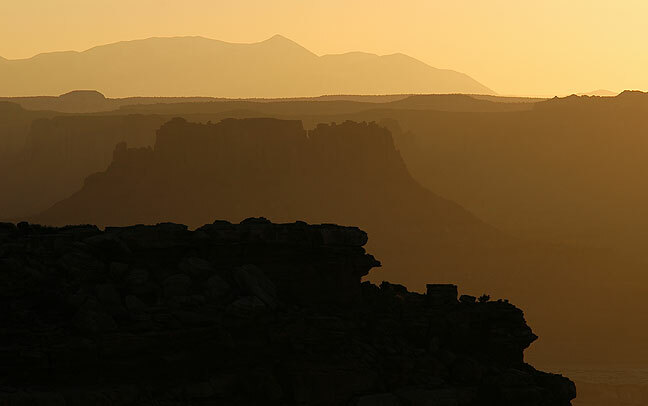 This broader view shows the sunset at Grand View Point at Canyonlands National Park. 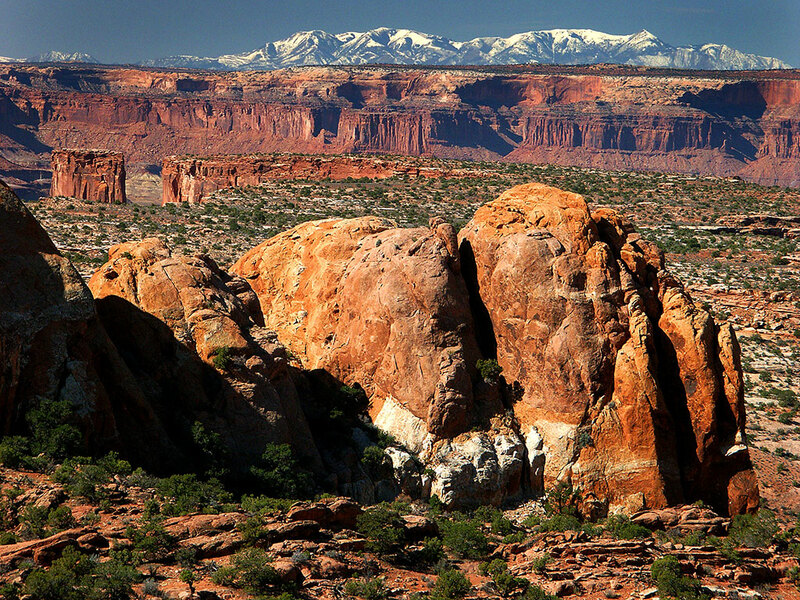 Looking east from Canyonlands’ Grand View Point shows this handsome rock outcropping at cliff’s edge with the La Sal Mountains in the distance. This view looks west from Grand View Point, showing Elaterite Butte and the Henry Mountains. 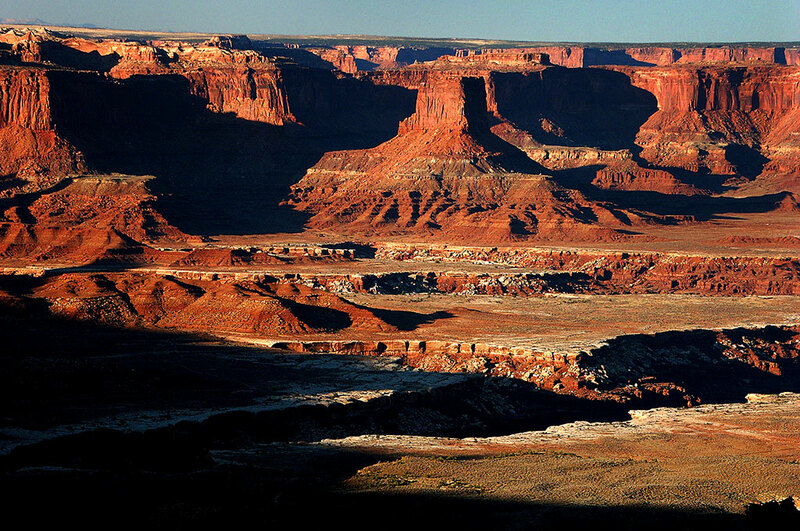 The western-facing cliffs at Grand View Point gather last light at Canyonlands. 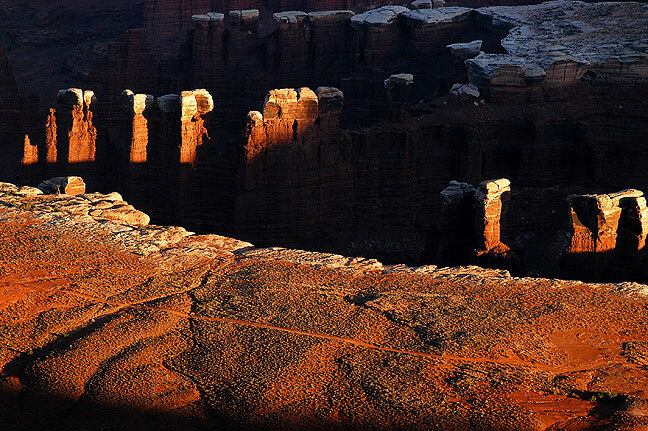 Monument Basin hangs onto last light at Canyonlands National Park’s Grand View Point. 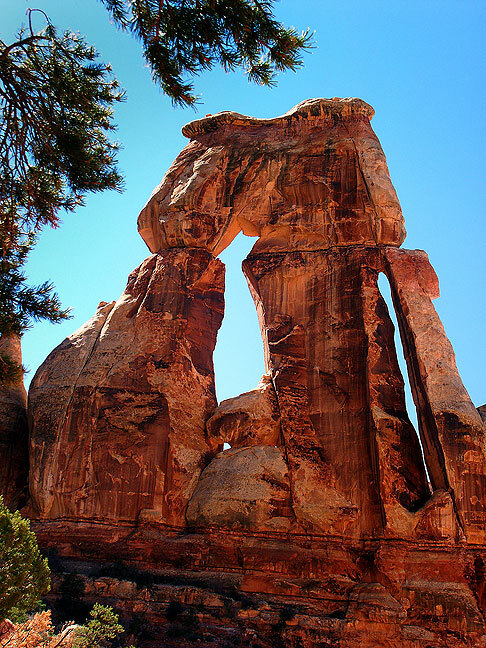 Impressive in size and complexity, Druid Arch stands in warm spring sunshine. 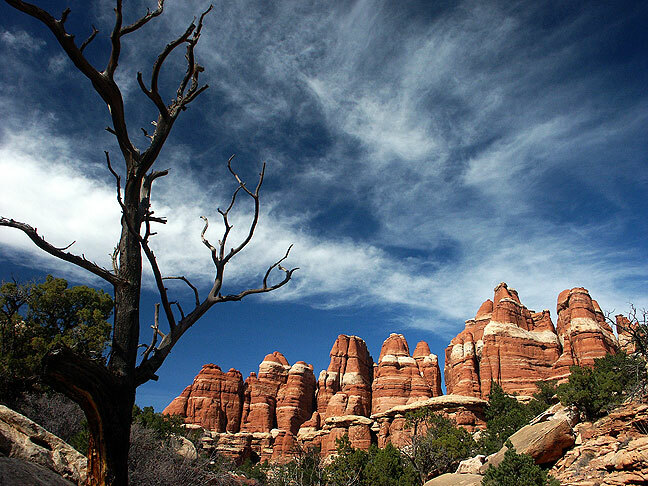 Our longest hike of the trip was in the Needles district in Canyonlands, to Druid Arch. 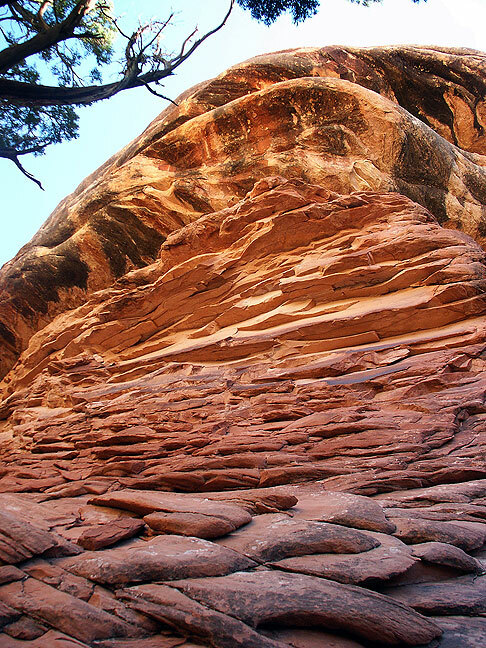 The hike follows Elephant Canyon for most of its length, which is very beautiful. As the day progressed, we were greeted by record heat, and by noon it was 80 degrees. The last quarter mile of the approach involved a bit of scrambling. The arch itself was much larger and more impressive than I thought it would be. 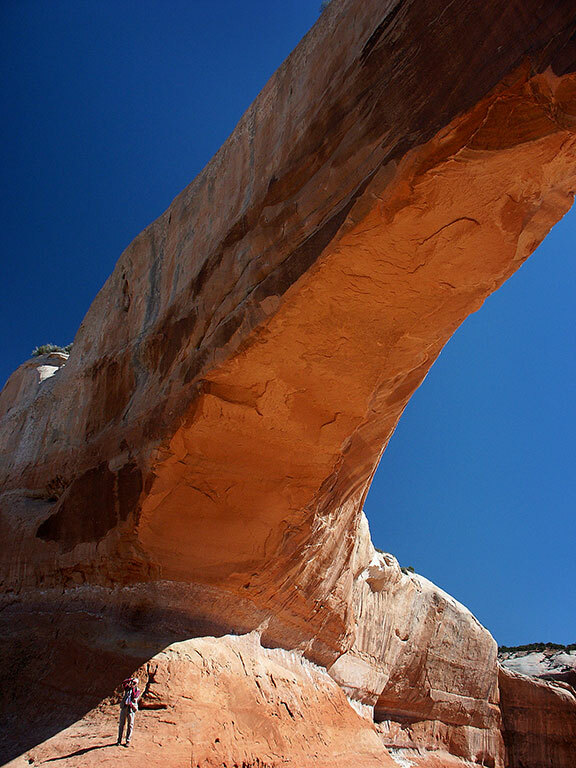 The Cedar Mesa sandstone of Elephant Canyon gets higher and more impressive as you approach Druid Arch. 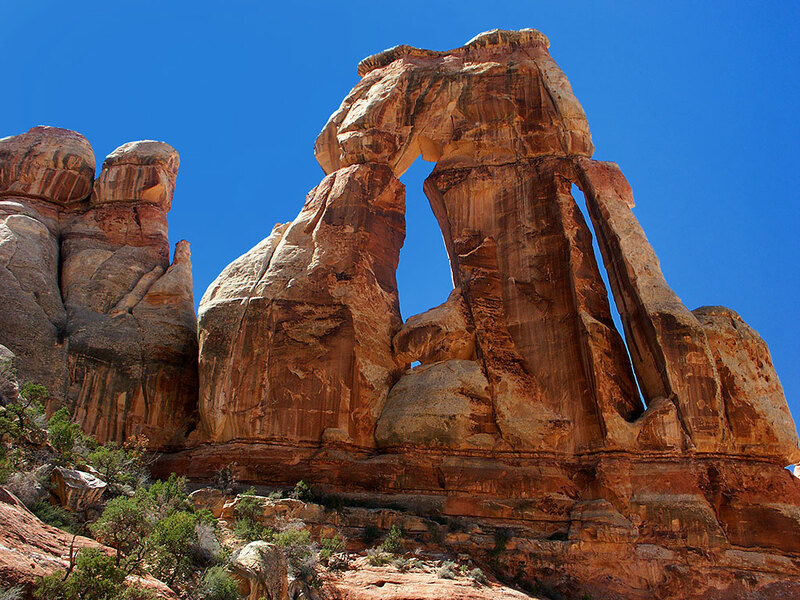 Druid Arch stand at the top of Elephant Canyon in the Needles district at Canyonlands National Park. 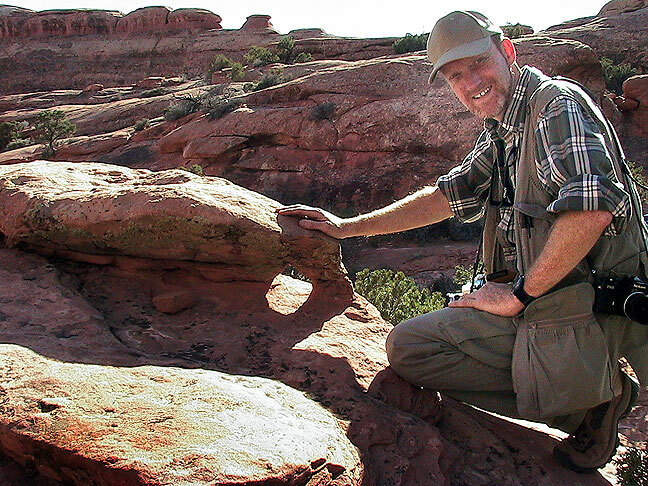 The author smiles for the camera at the top of Elephant Canyon, the location of Druid Arch. 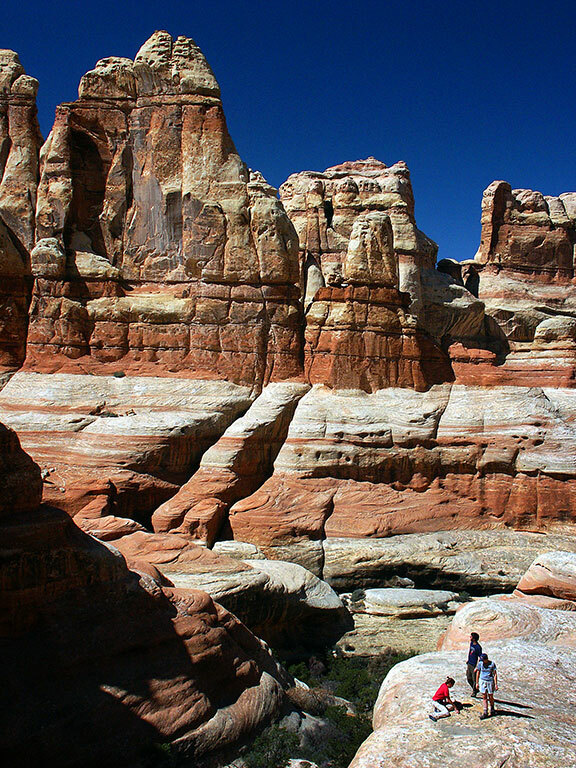 Visitors are dwarfed by Cedar Mesa sandstone at Druid Arch. 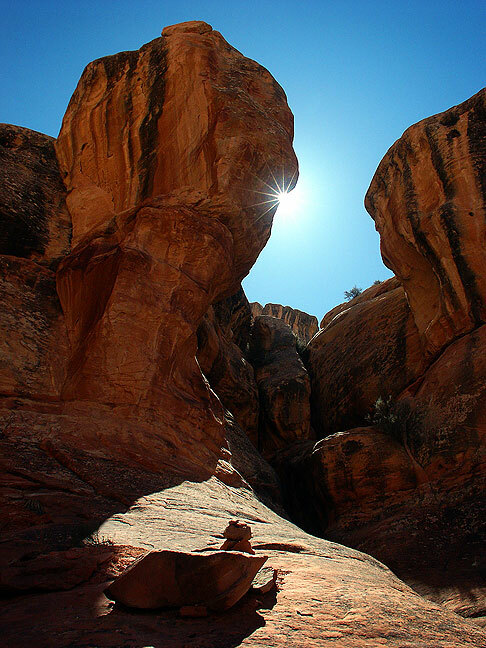 Brilliant sun and a beautiful sky enhance Elephant Canyon in the Needles District at Canyonlands National Park. 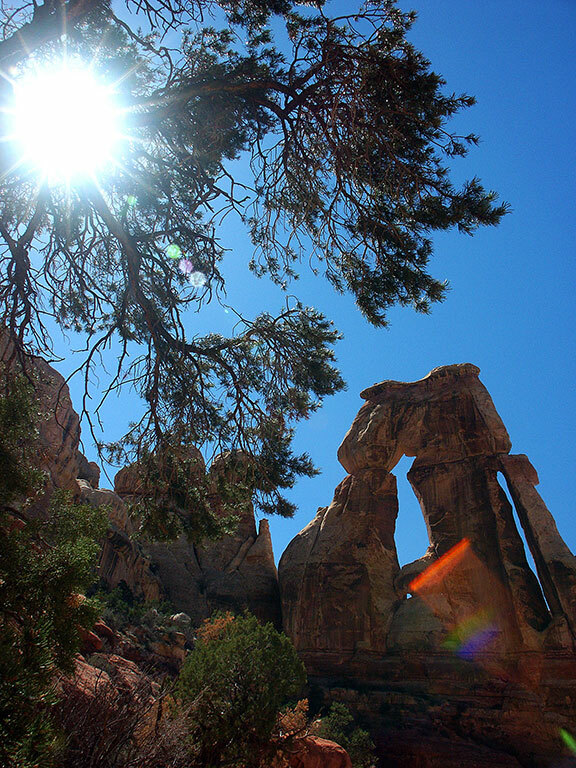 Our entire trip featured brilliant spring sunshine, as in this image on the Druid Arch route through Elephant Canyon at Canyonlands. Elephant Canyon a mile or so from the trail head; it was on this hike that Michael injured his knee. 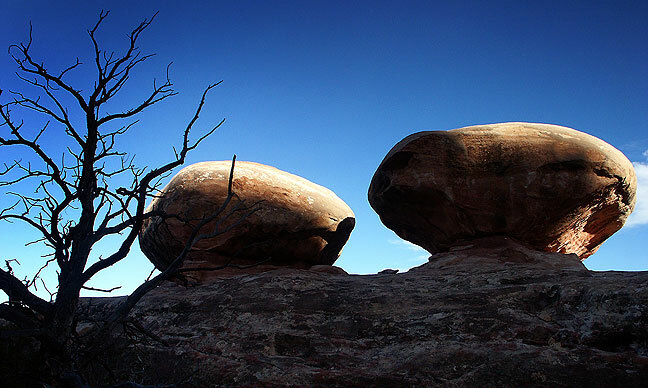 Mushroom rocks are touched by late afternoon light on our hike back to the Elephant Hill trail head. 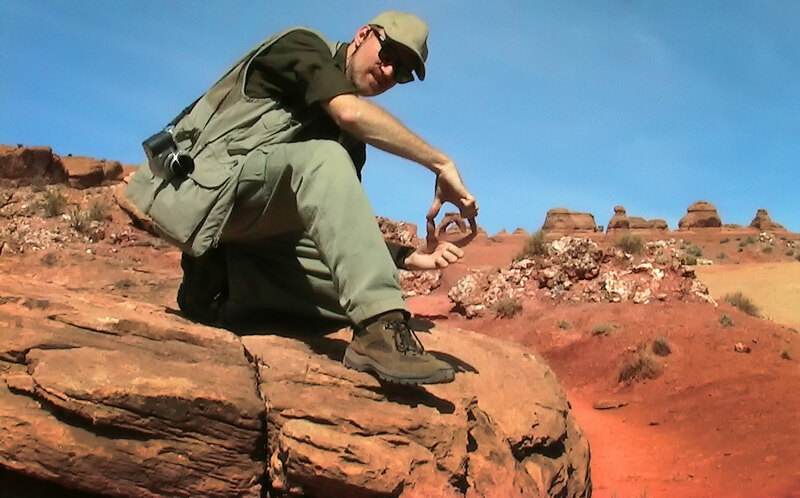 Michael looks up at Druid Arch at the south end of Elephant Canyon. By the time we reached the arch, Michael’s knee was killing him. Several times I offered to stop and rest, but he was concerned that if he stopped, his knee would stiffen and make matters worse. He made it back to the trailhead, but ended the day in considerable pain. A Park Ranger named Paul found gummy bears stuck to the tips of yuccas near Elephant Hill. At the end of the day, we stopped at the Wooden Shoe Butte turnout to shoot the sunset. 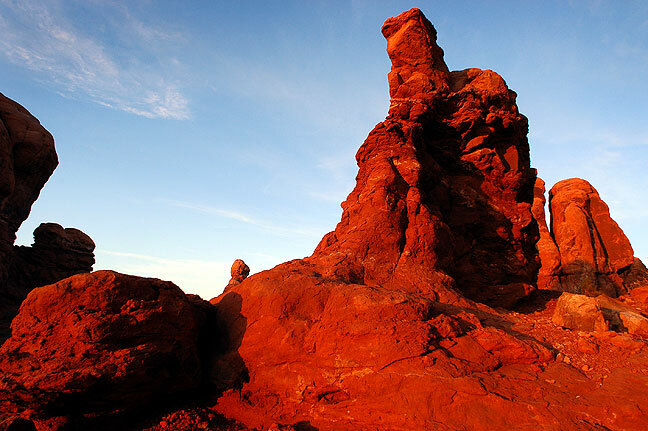 Squaw Butte at Canyonlands takes on red light at sunset. 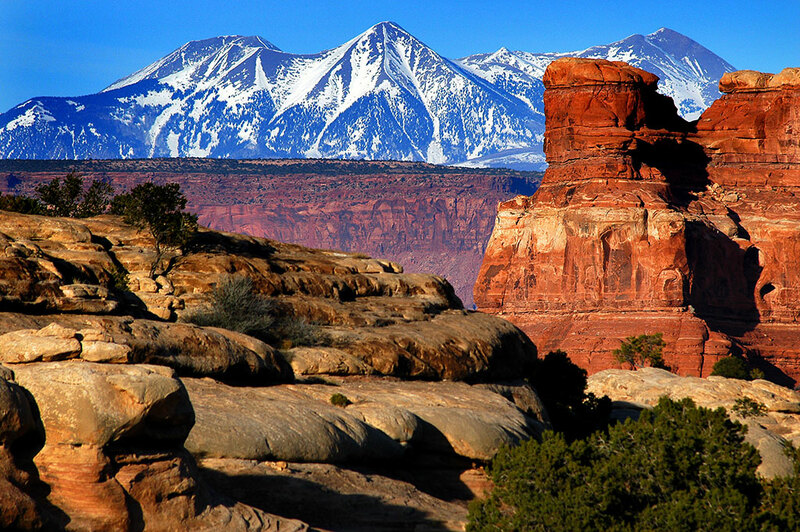 This view made from The Needles district at Canyonlands looks northeast toward the La Sal Mountains. The light and color were superlative. 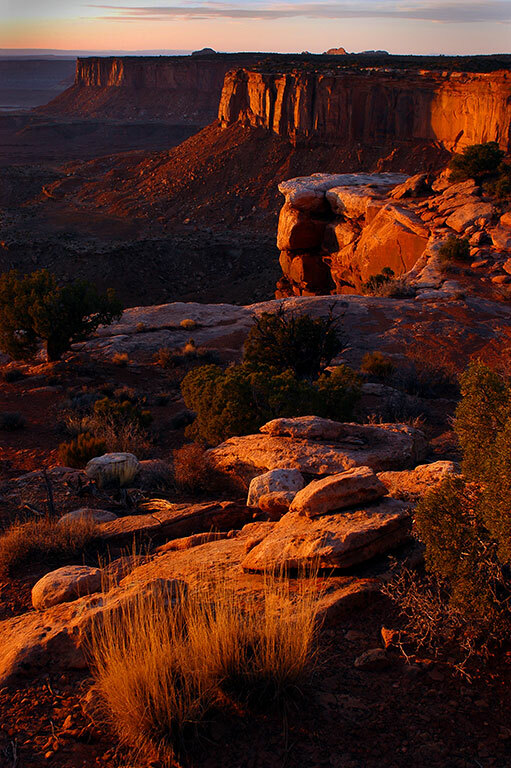 Wooden Shoe Butte and Sixshooter Peak are visible in this sunset image at The Needles district of Canyonlands. We stopped to shoot this after sunset on the drive out of Canyonlands. 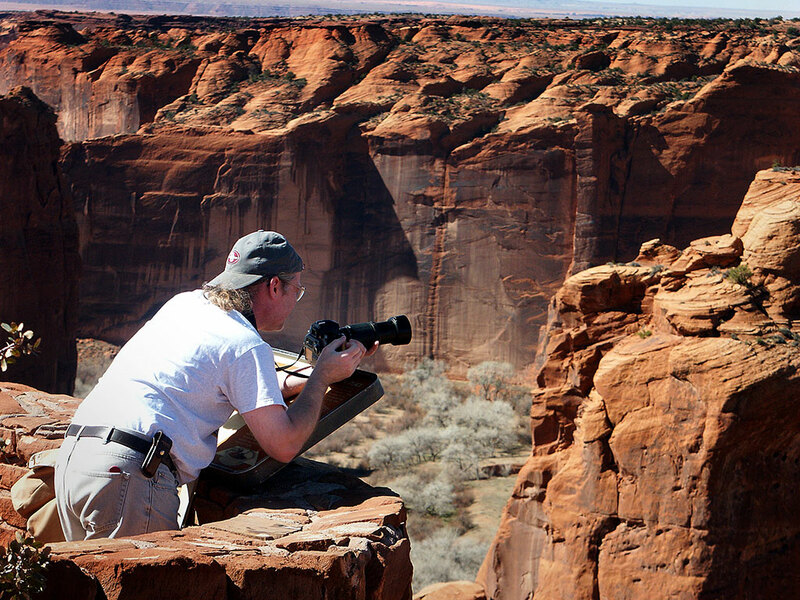 Michael leans out to make a picture from one of the overlooks at Canyon de Chelley National Monument near Chinlé, Arizona. 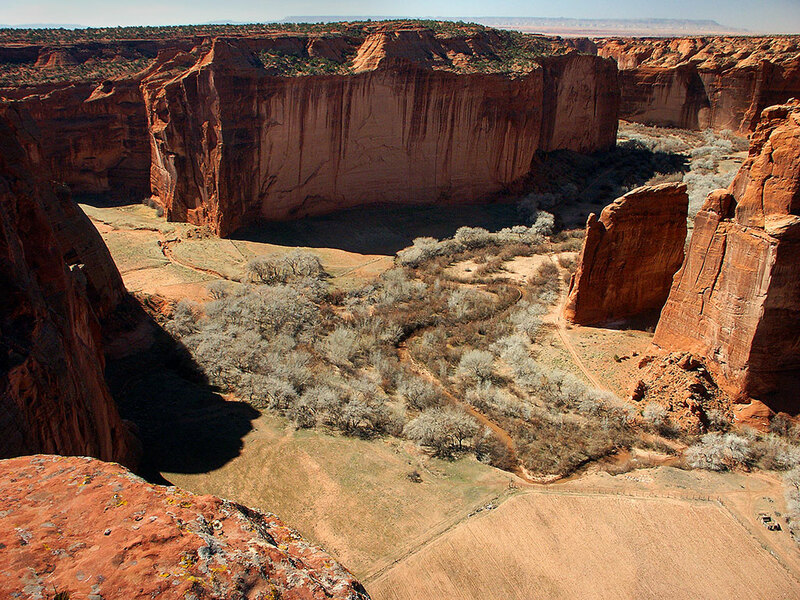 As we eased east toward home, we drove to Canyon de Chelly, where we walked to a few of the overlooks. 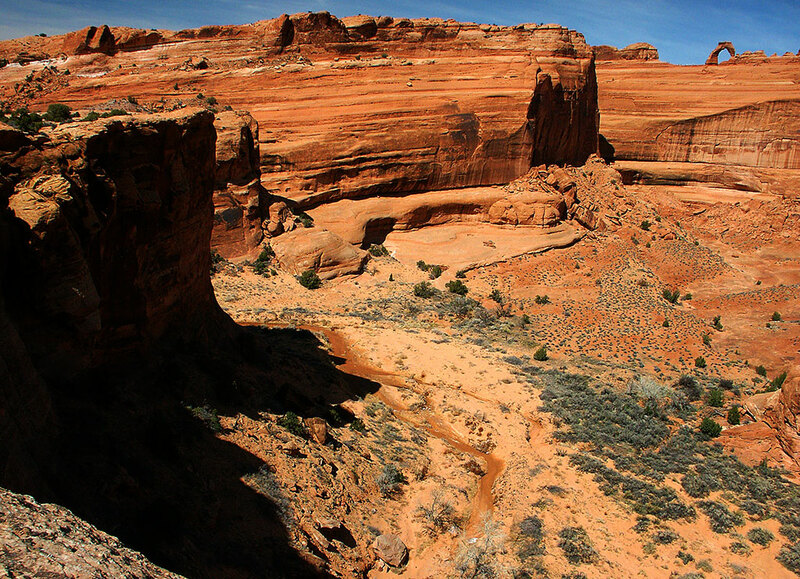 This view looks north down Canyon de Chelley. 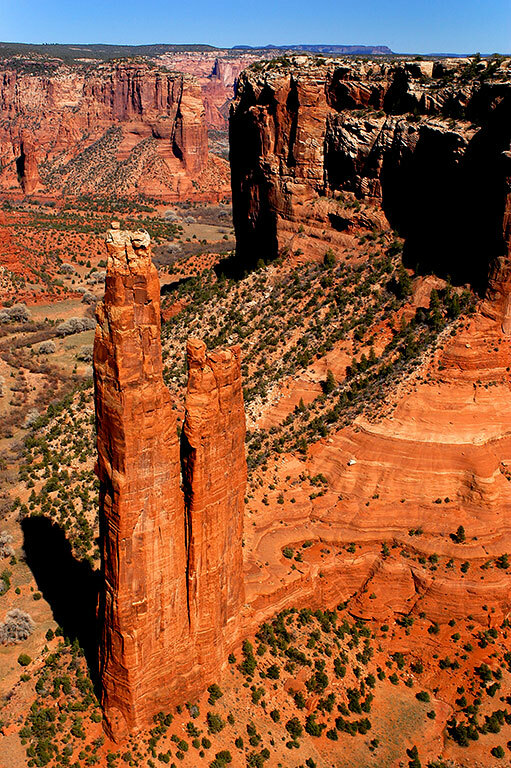 The Spider Rock Overlook is a Canyon de Chelley favorite. 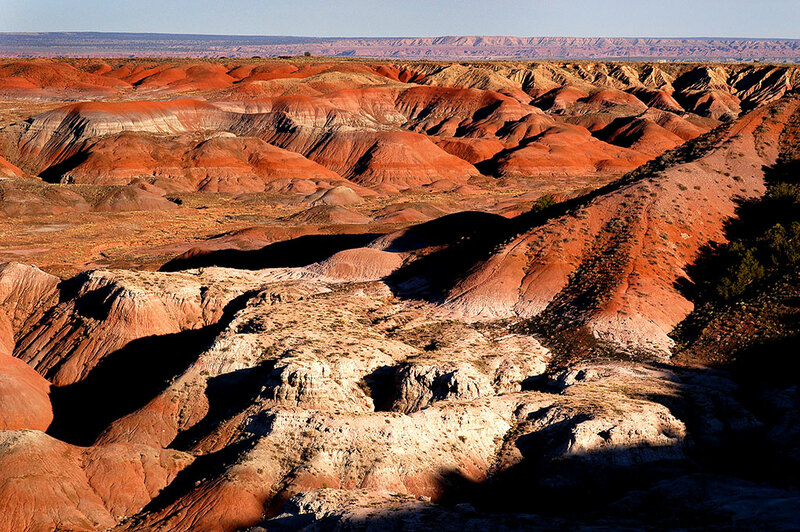 Michael expressed disappointment in the Painted Desert, saying it wasn’t nearly as impressive as he expected. By late afternoon, we were in Petrified Forest National Park. We first stopped at the Painted Desert overlook, where Michael expressed with dismay, “This is the Painted Desert?” I guess he expected more. We continued our drive through the park as last light approached, in an increasing hurry as the light disappeared. 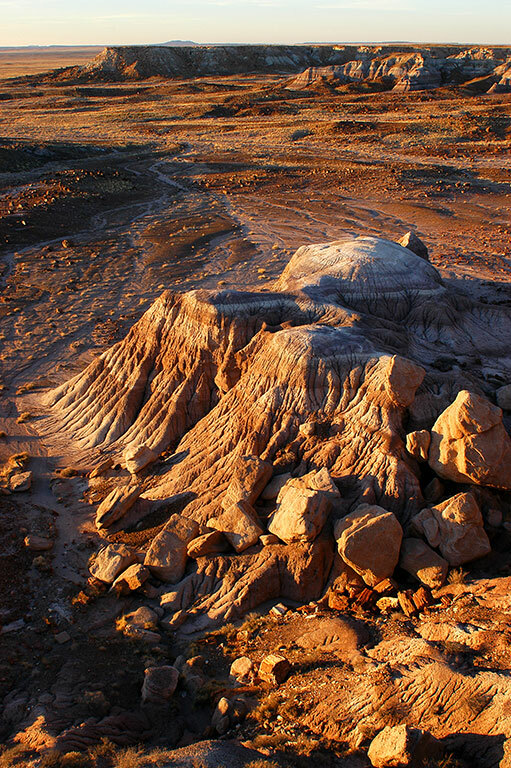 Last light approaches at Petrified Forest National Park, Arizona. 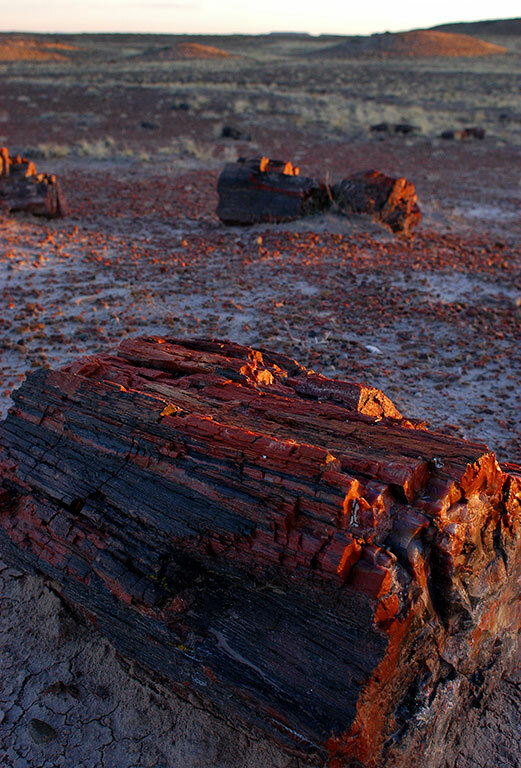 With just a few seconds of daylight remaining, we managed to make this image of petrified wood by the main road at Petrified Forest. 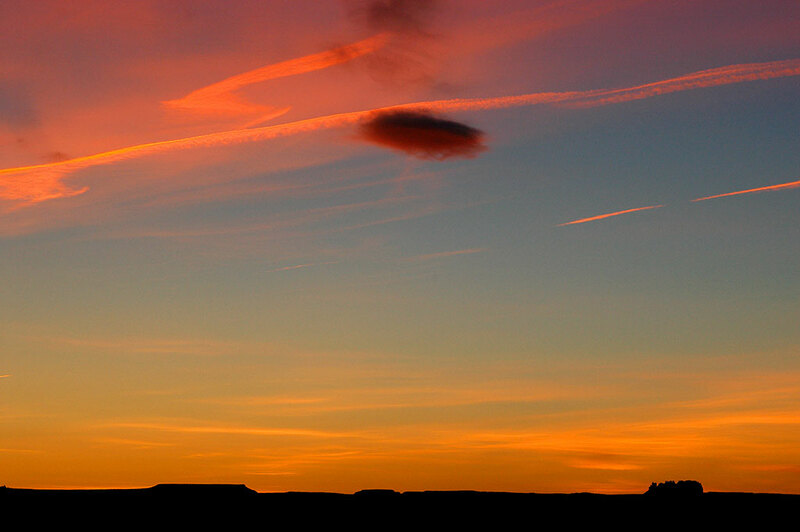 On the way out of Petrified Forest, we made this image of the sky about 20 minutes after sunset. Your host makes a self portrait in the mirror of Michael’s Honda Element as we make the long drive home to Oklahoma. Stunning photographs, some of the best ever. You can see how clear the air is. 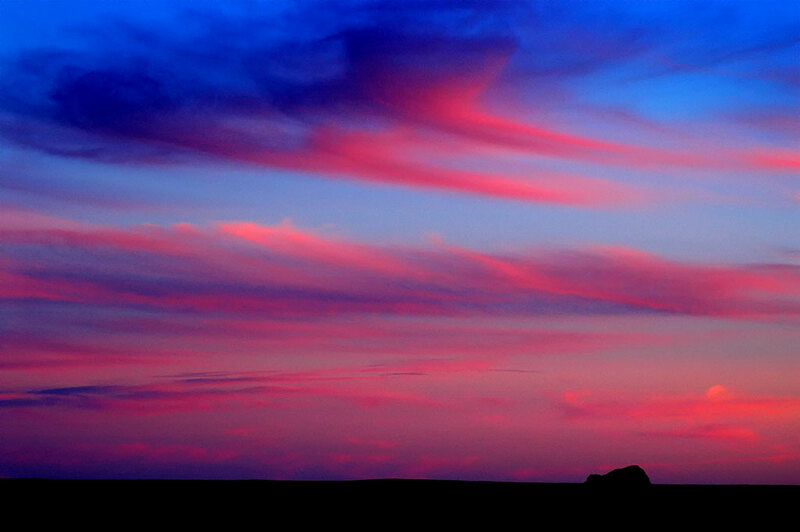 Unbelievable color in the sky. Tight, concise writing style. This is, I think, the model for how a travelogue should be done. But what happened with Michael’s knee? How did he injure it? I’m three seconds from quitting my job and just driving West right now. Michael’s knees always bothered him. Water on the knee was one possible culprit. When we made it back to the trail head, he folded down the front seat back and sat behind it with his leg straight. He iced it back in Moab, and was somewhat better the next day. Superb images, as I typically expect from you. If I had to choose a favorite, I would pick this one: http://richardbarron.net/traveller/wp-content/uploads/2004/03/Needles-at-Sunset-03.jpg The four (at least) layers of varying distance, texture, and color are intriguing. It’s the kind of photo that a travel lodge should have printed wall-sized in the lobby to inspire guests. Who would bring gummy bears in his pack and not EAT THEM?